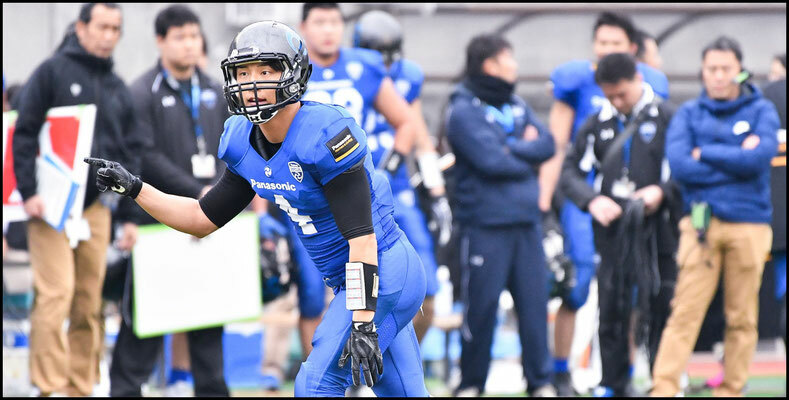 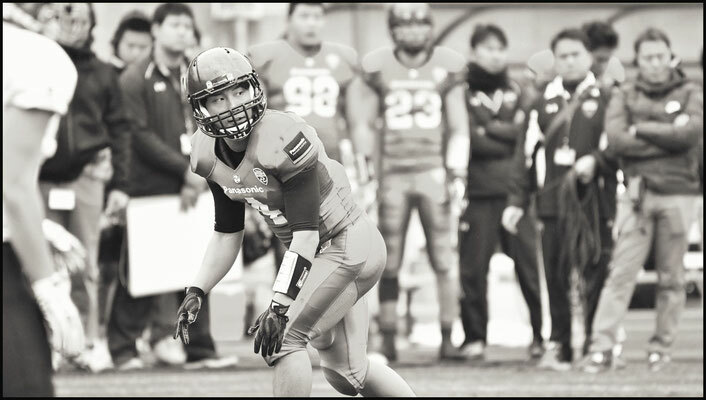 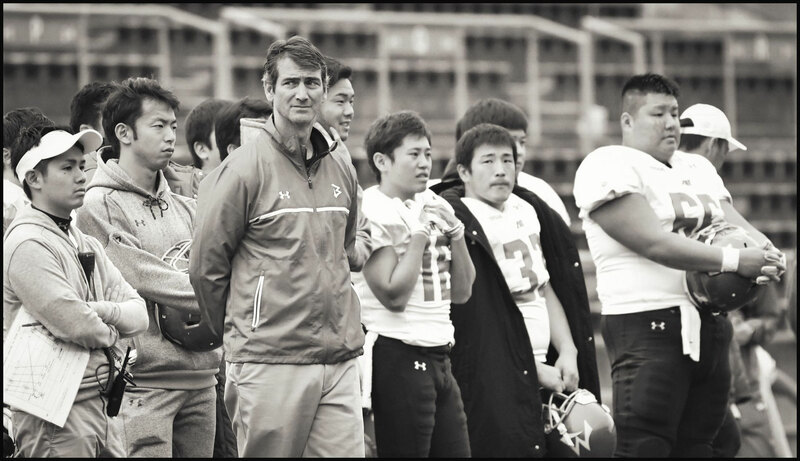 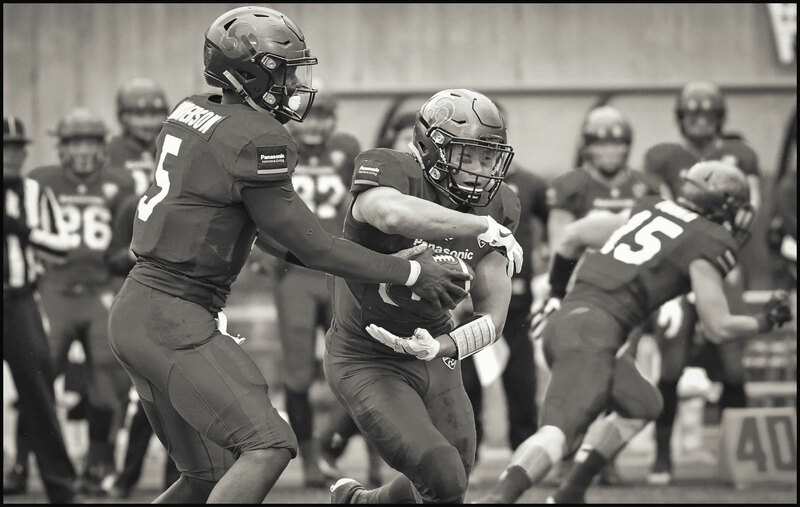 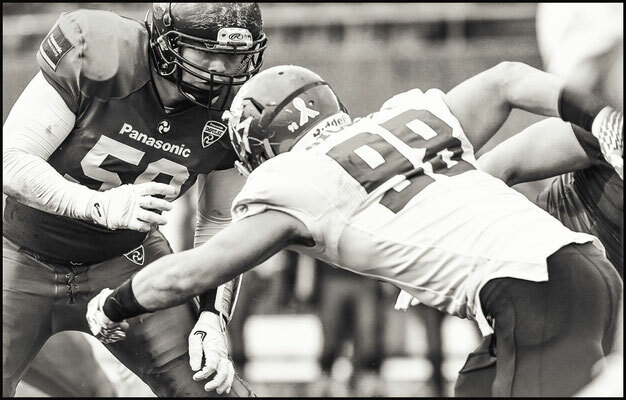 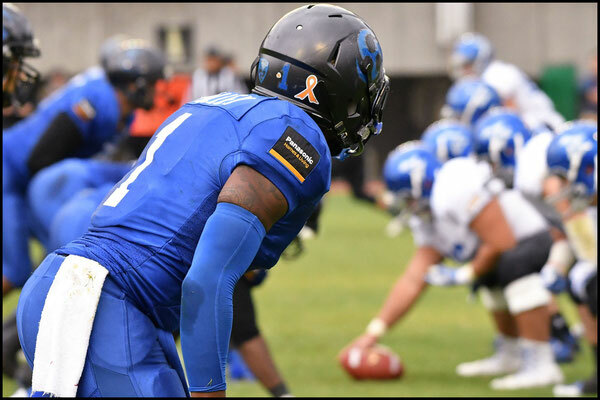 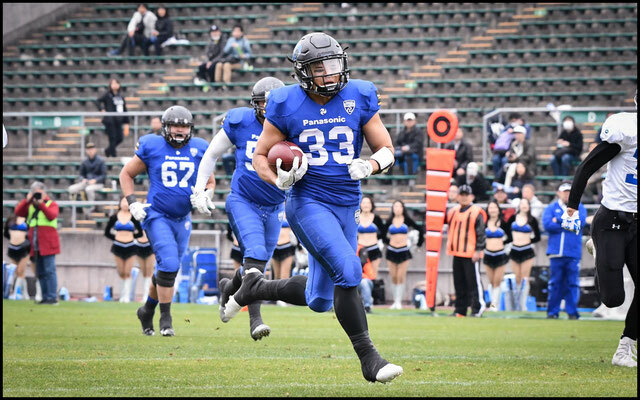 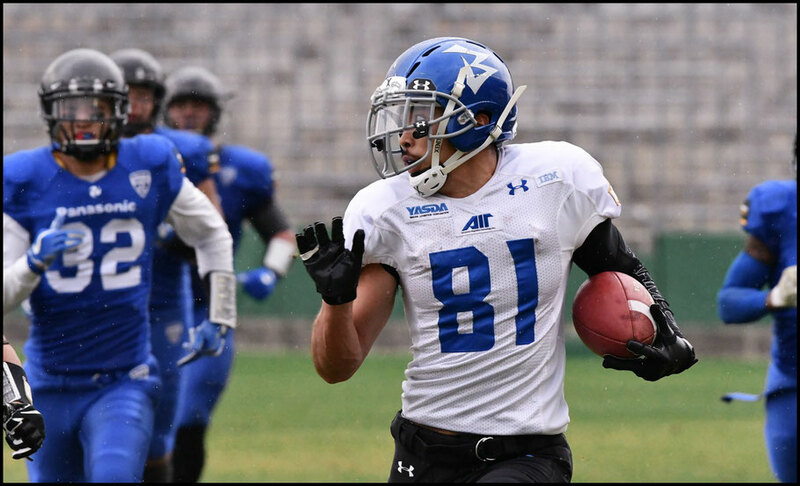 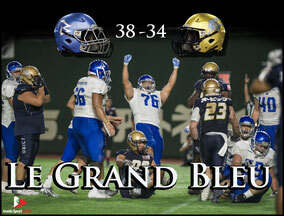 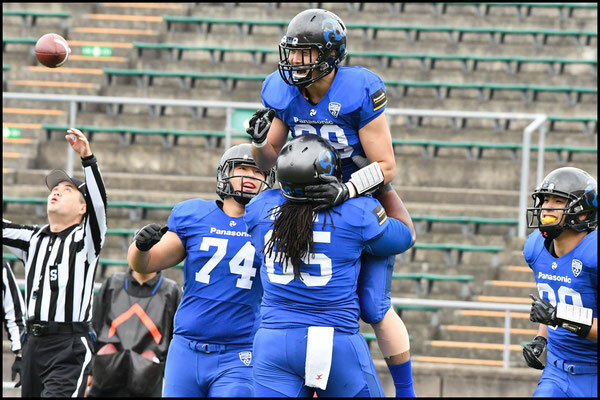 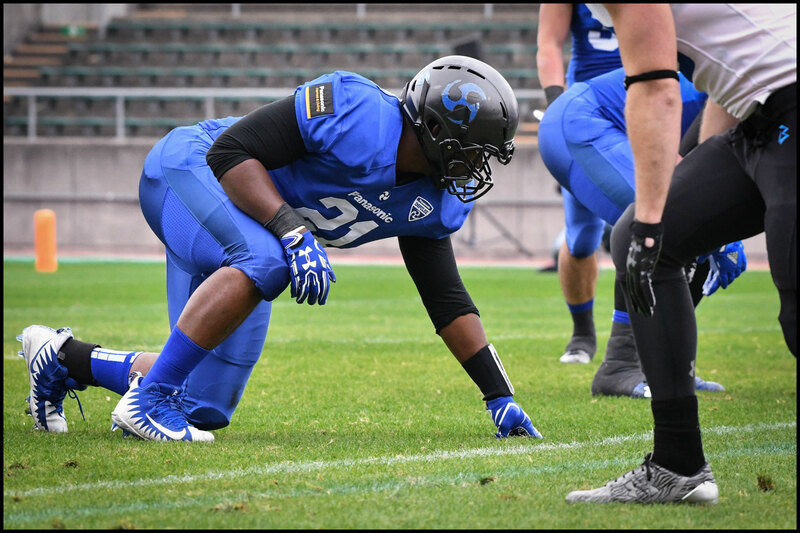 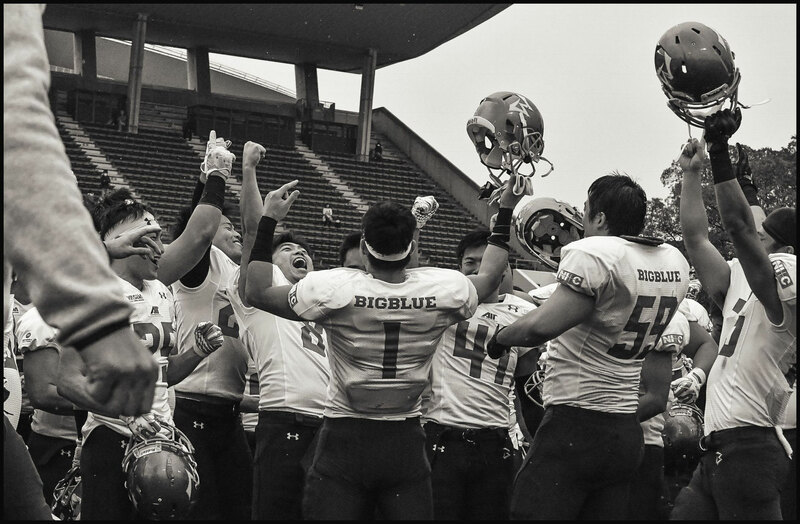 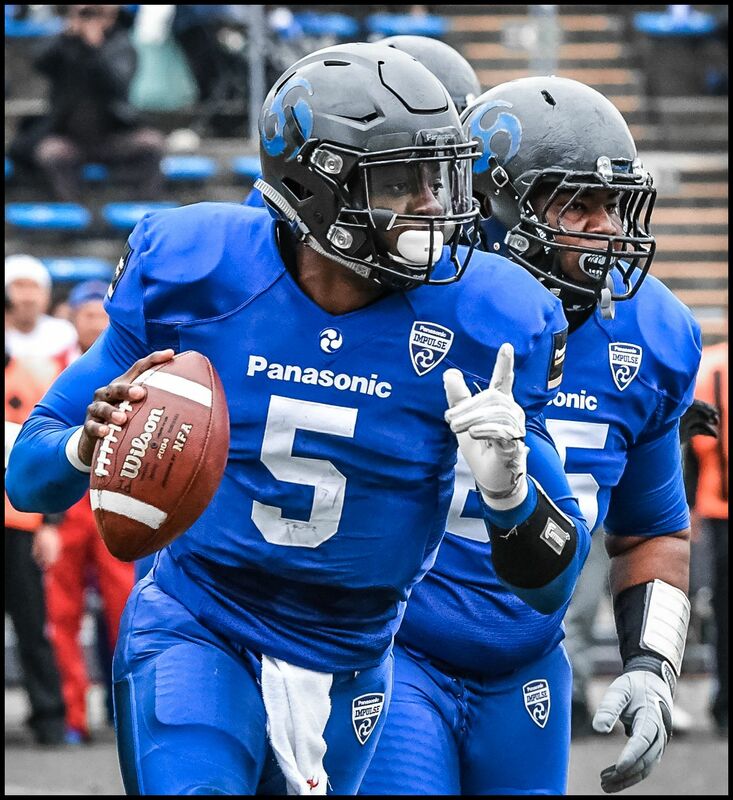 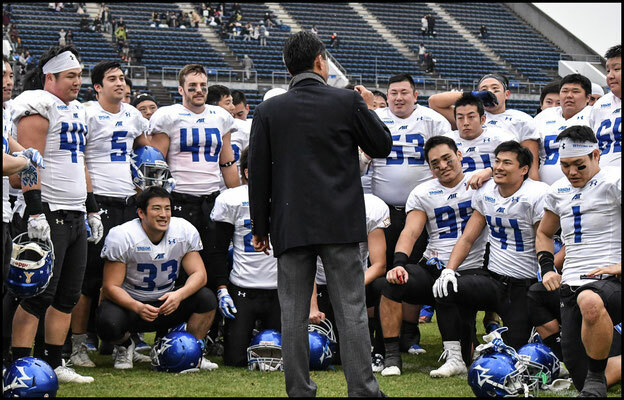 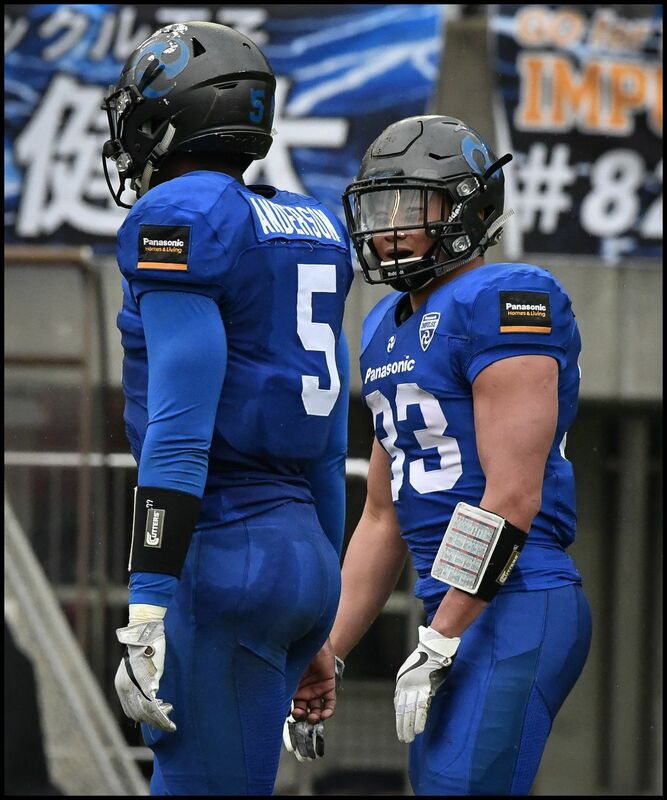 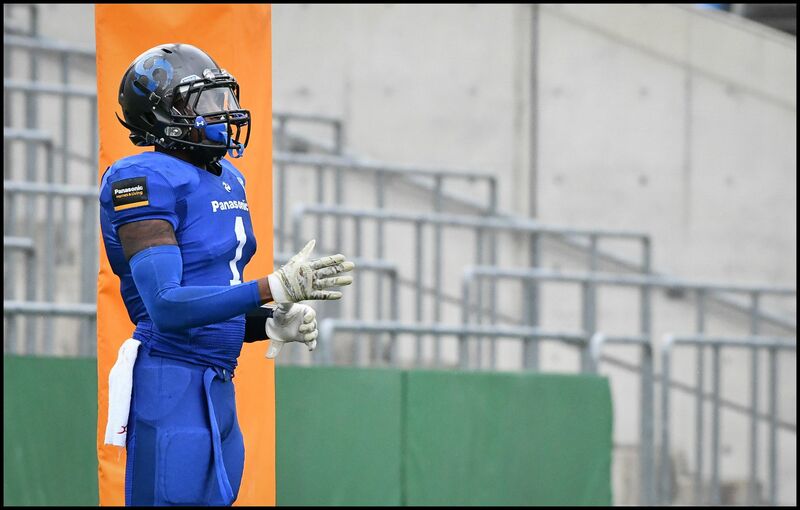 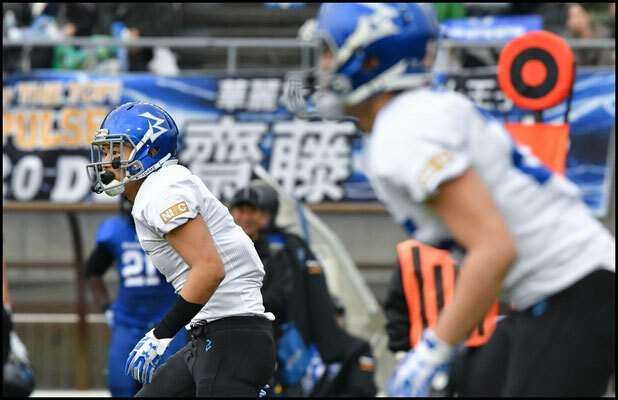 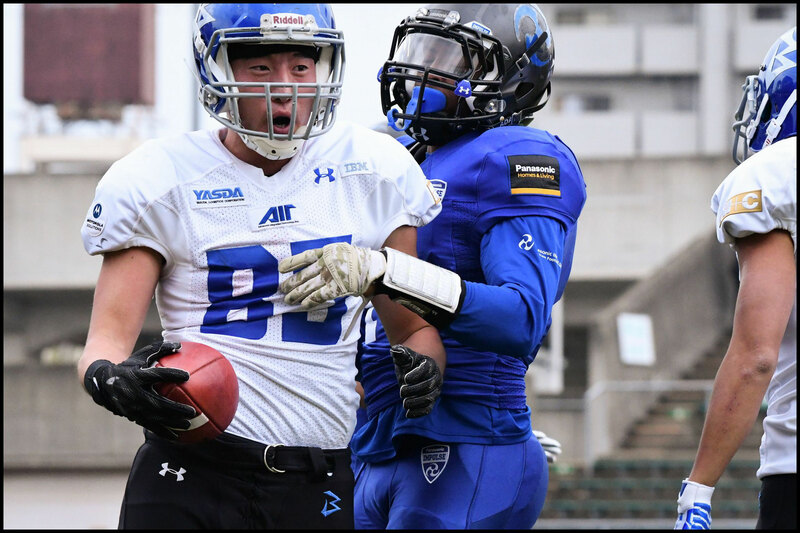 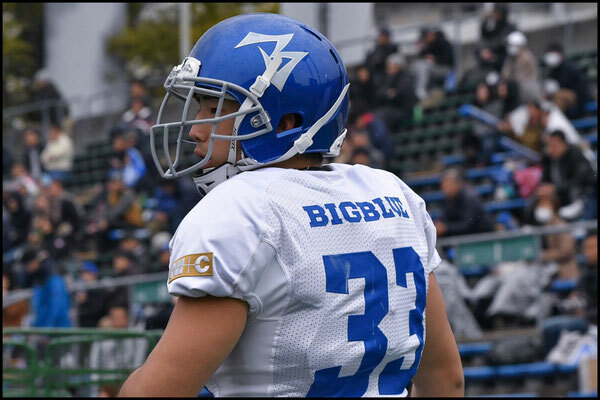 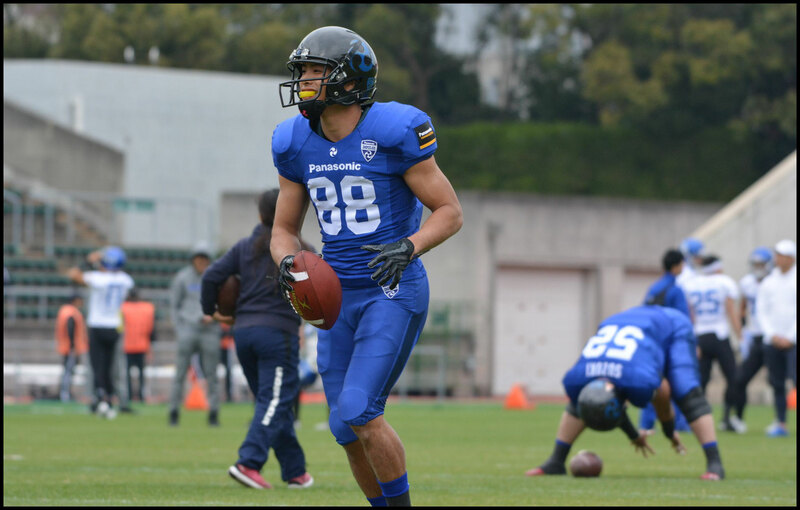 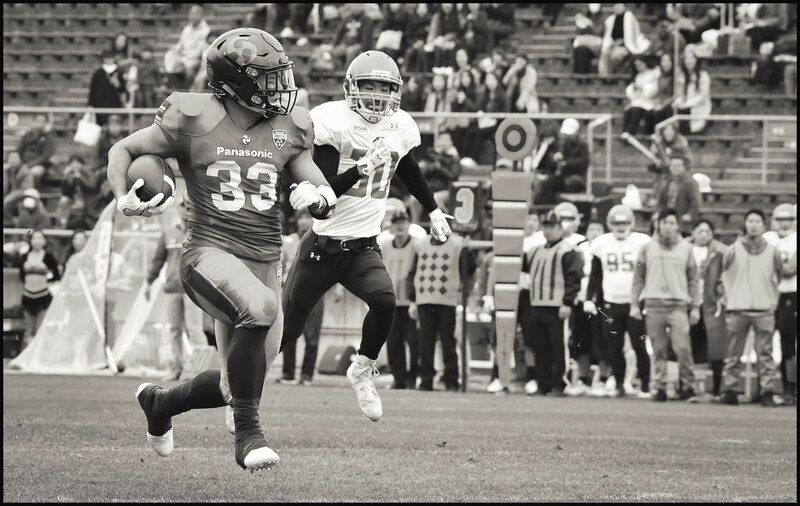 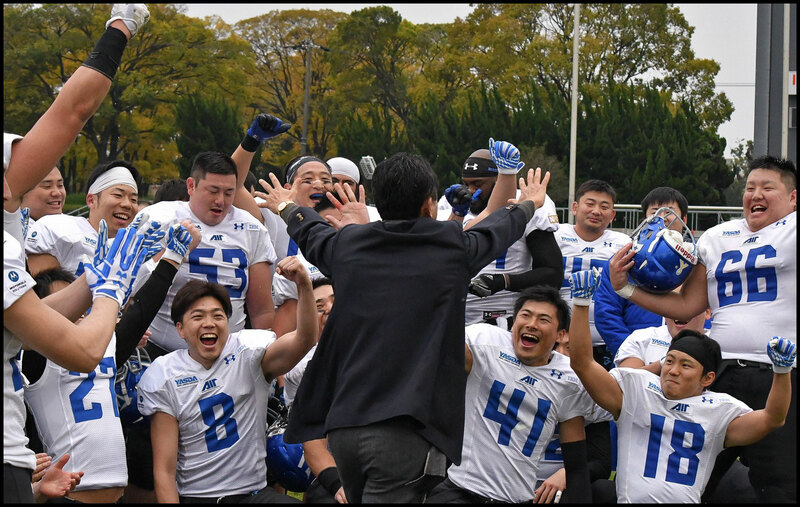 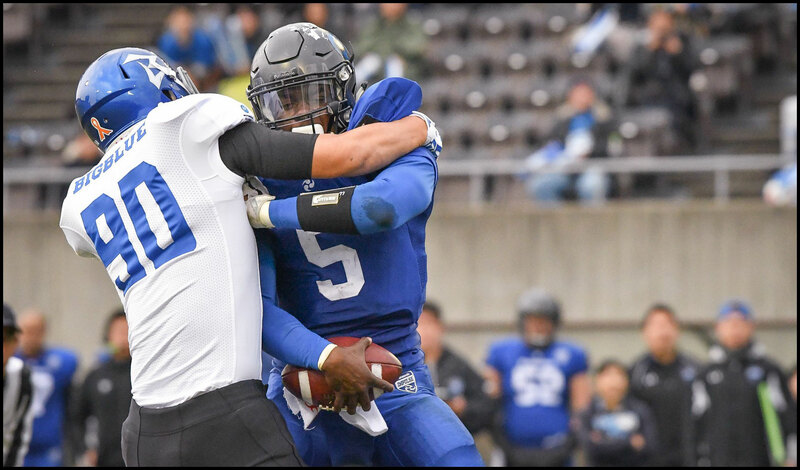 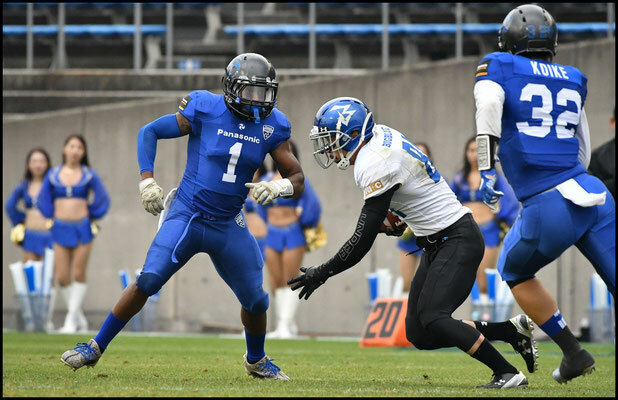 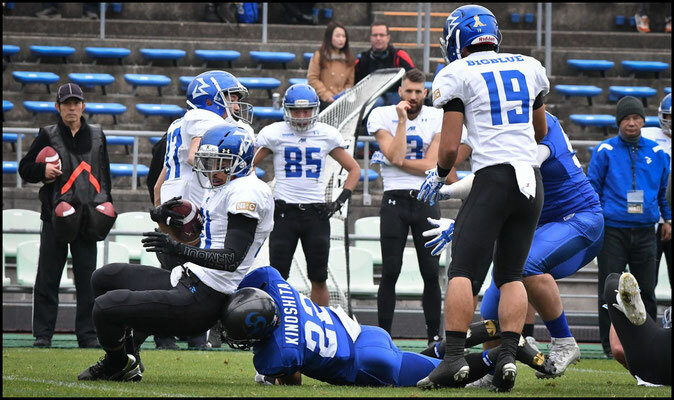 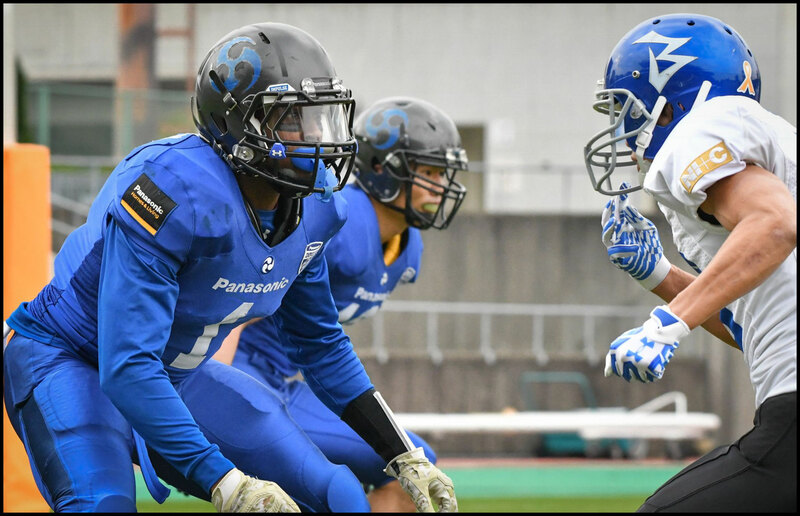 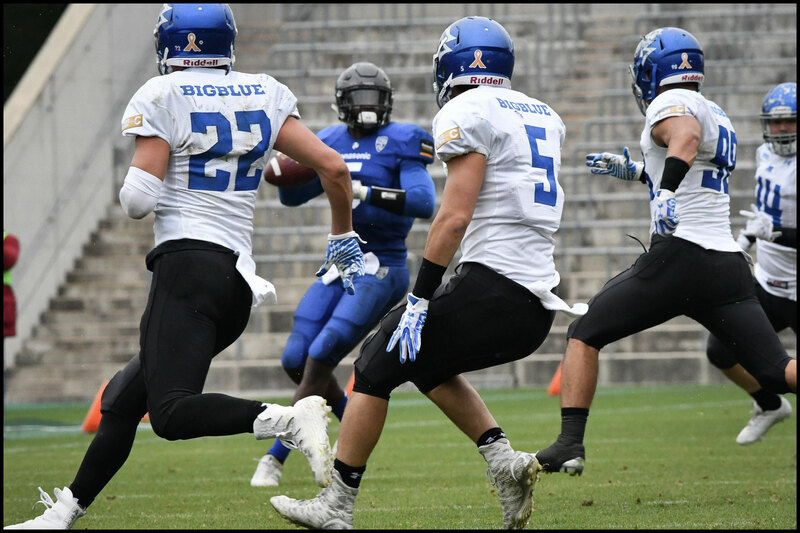 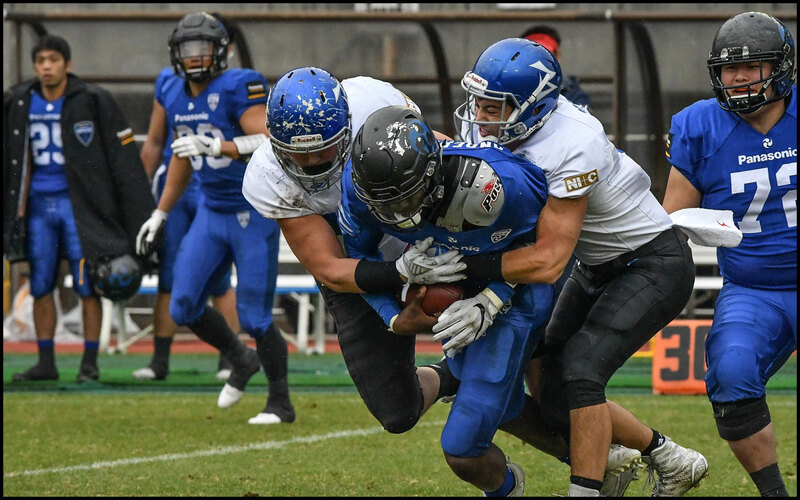 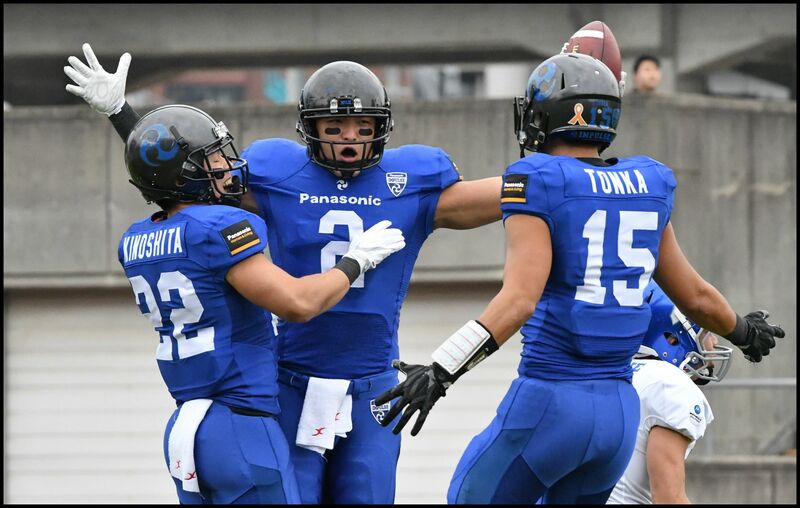 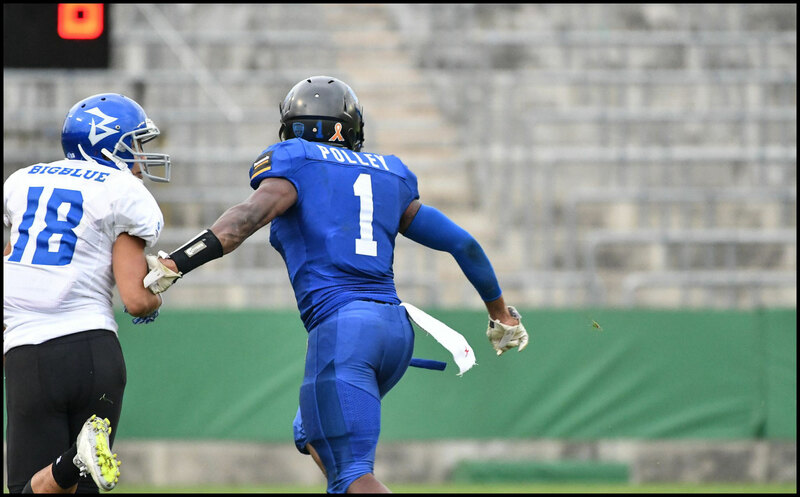 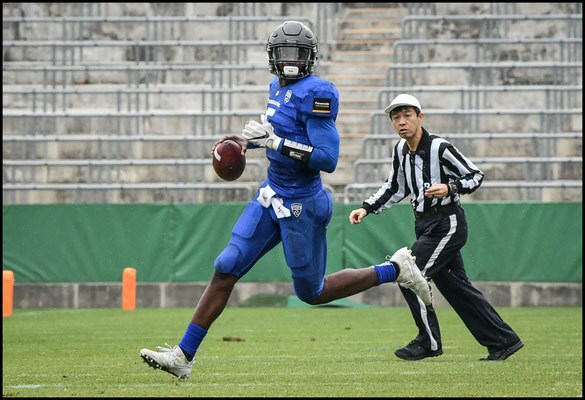 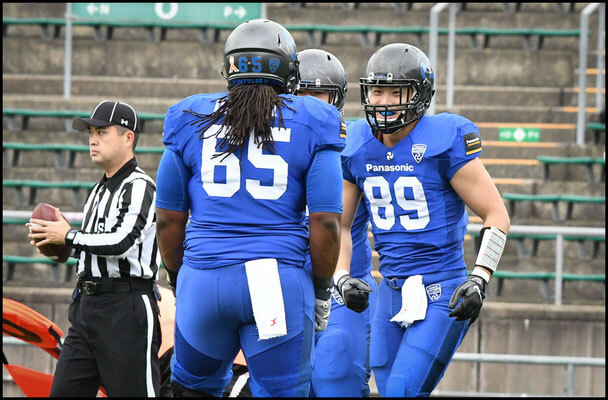 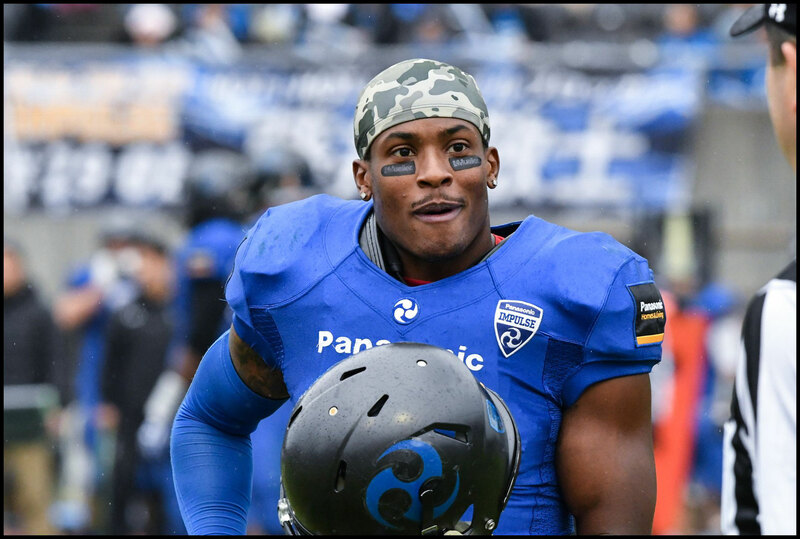 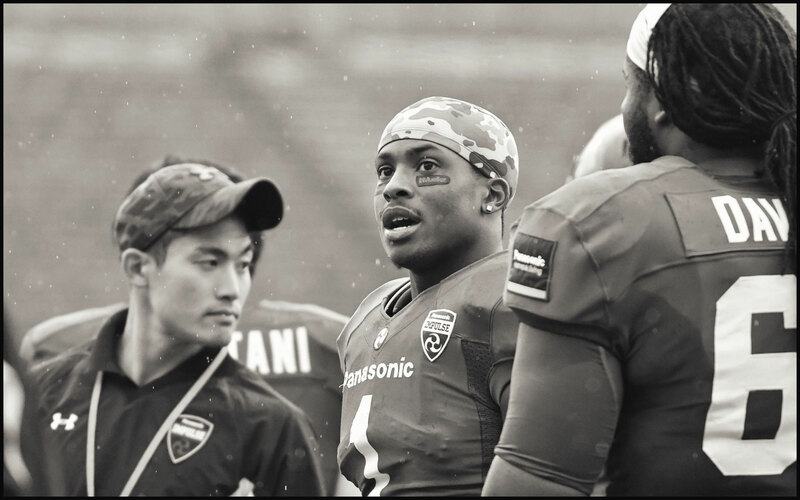 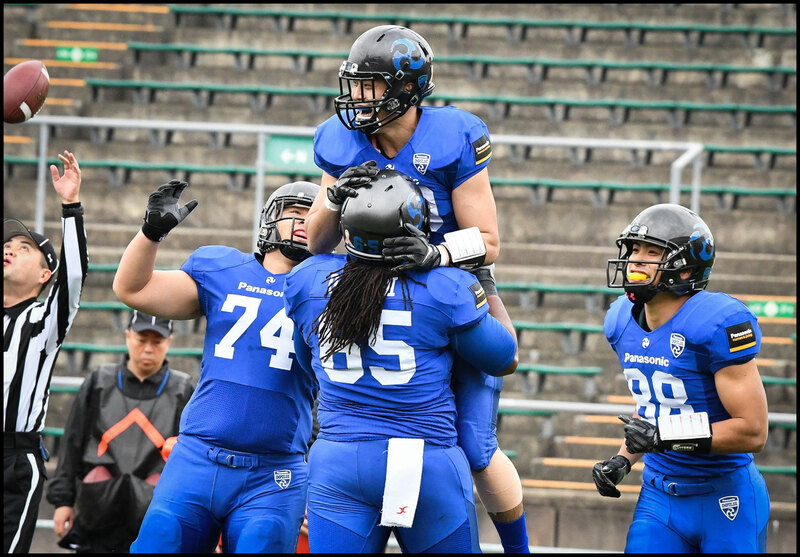 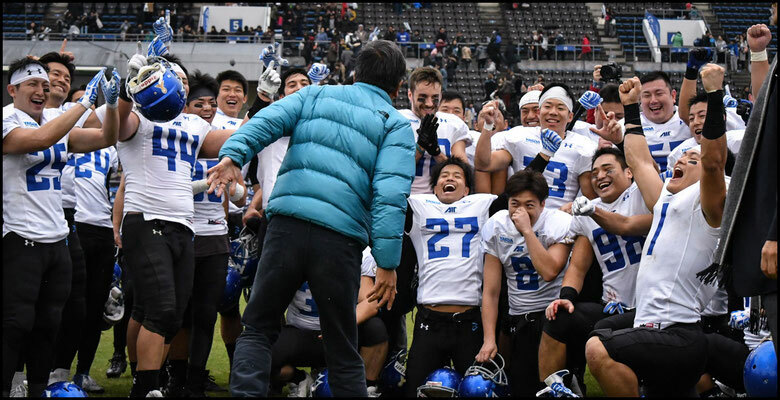 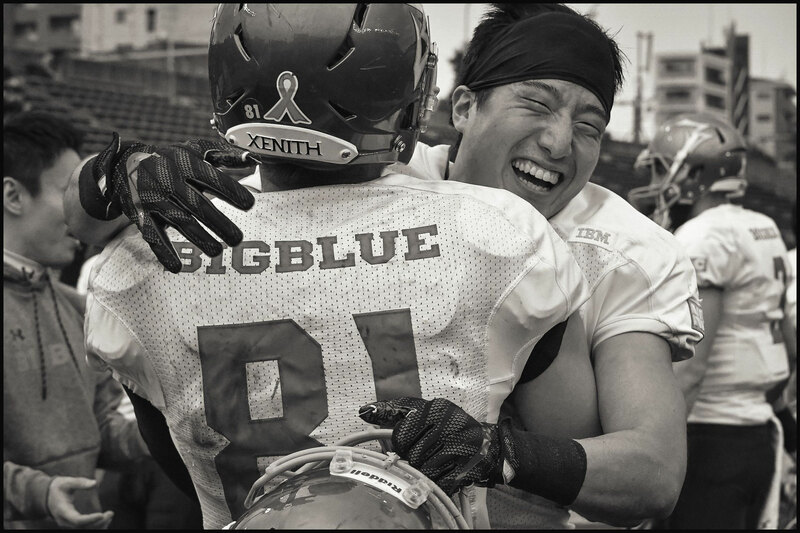 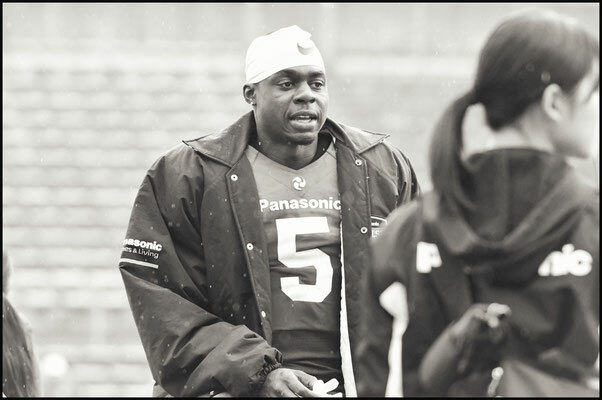 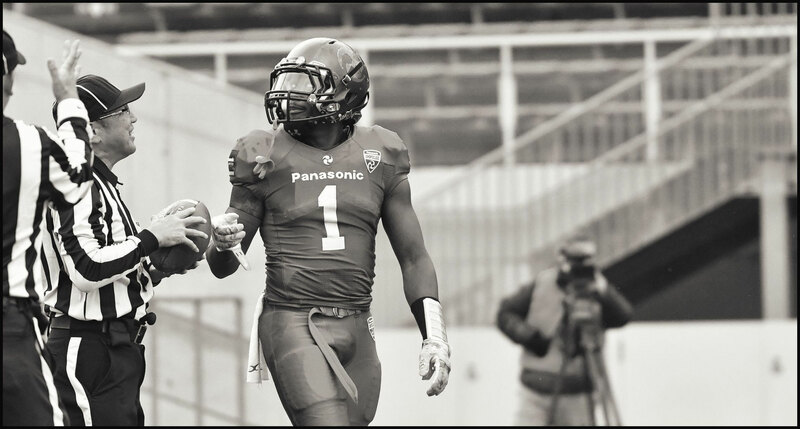 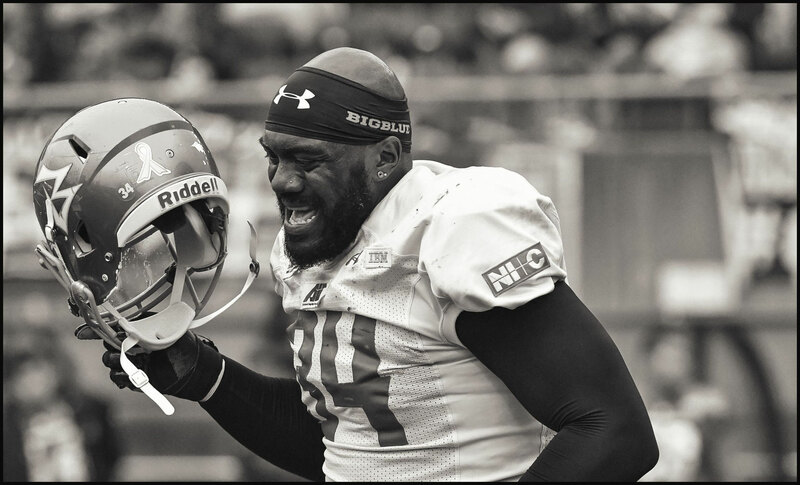 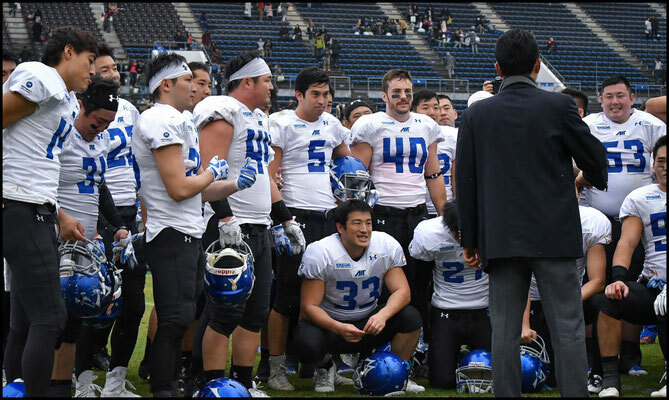 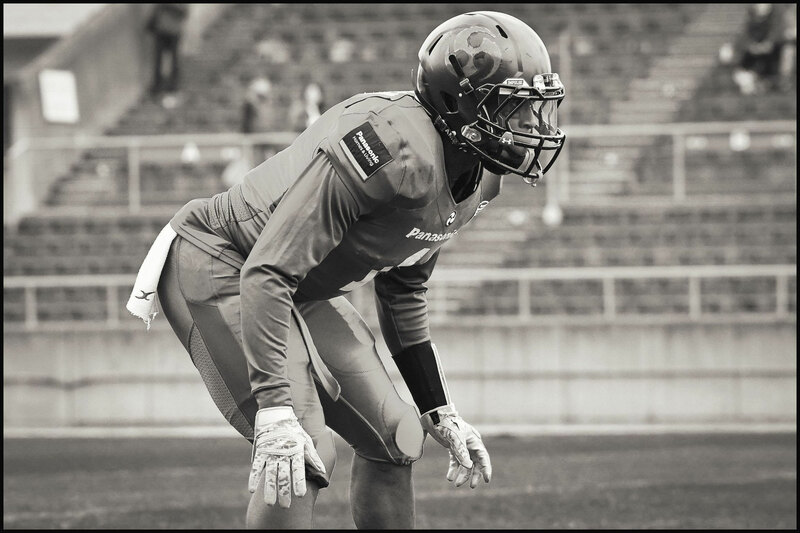 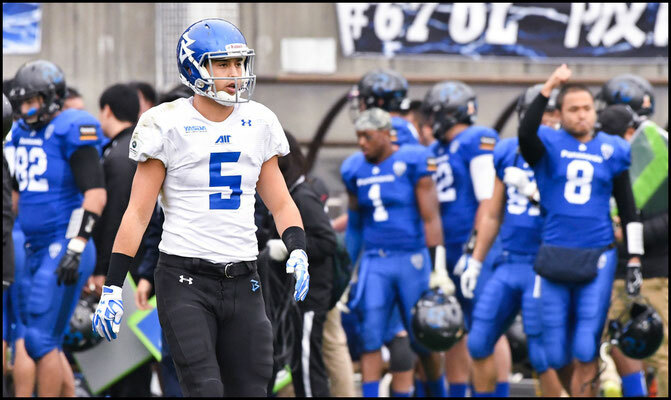 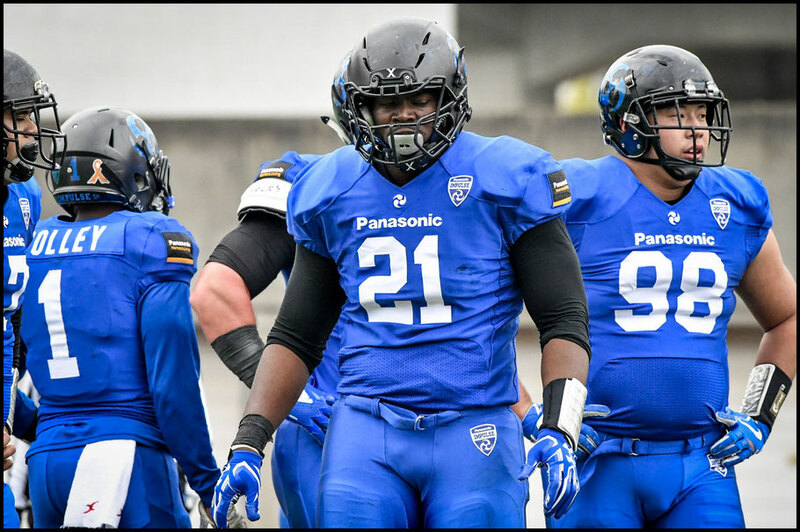 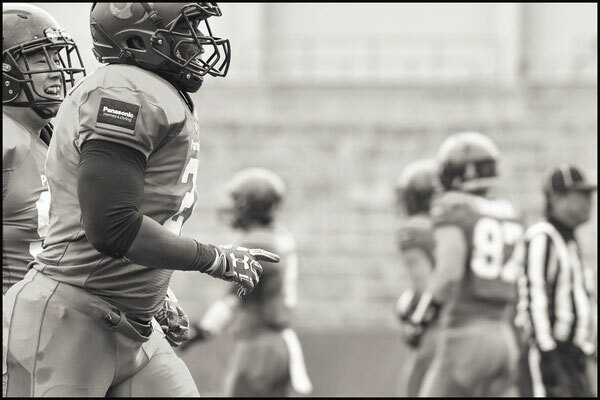 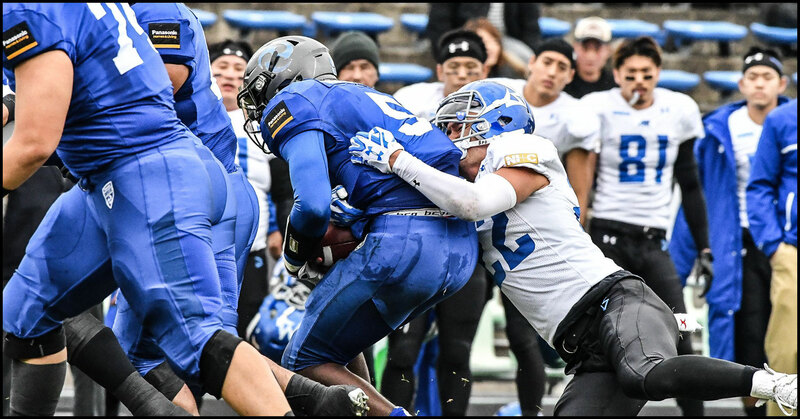 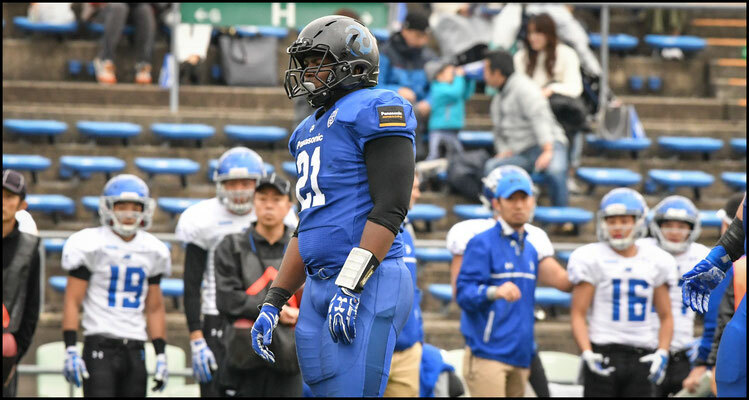 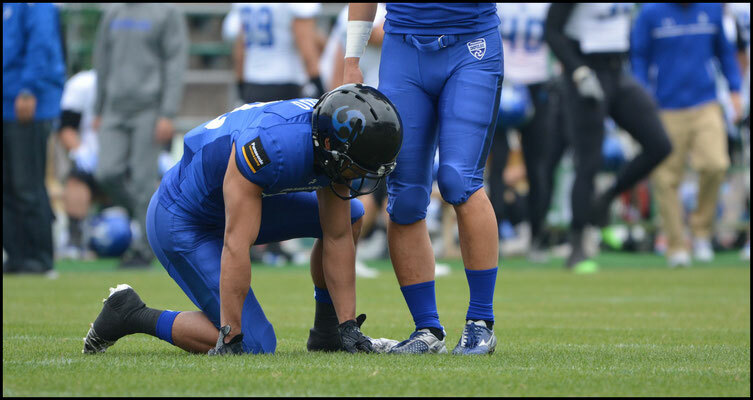 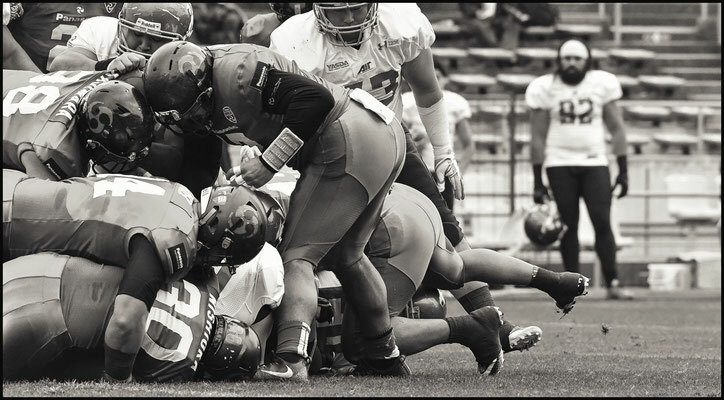 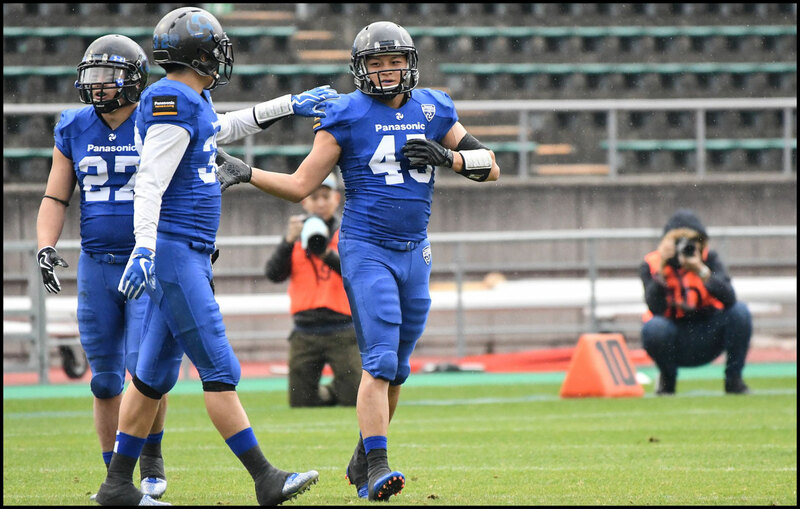 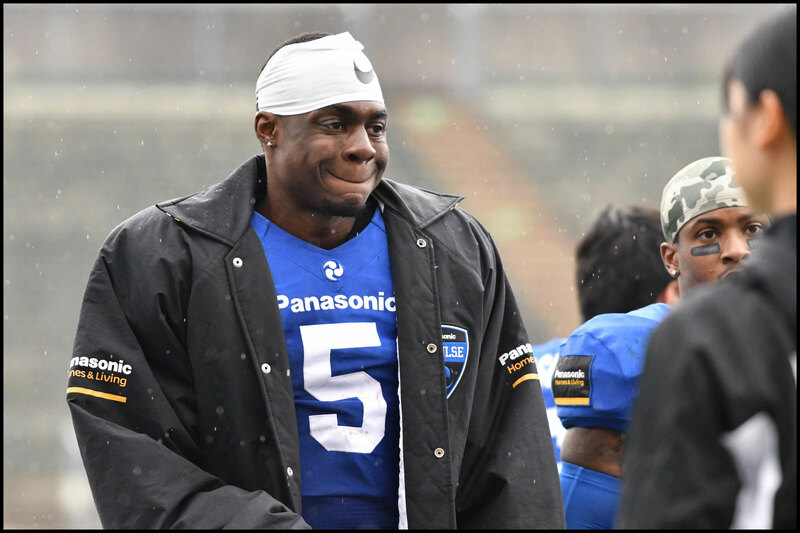 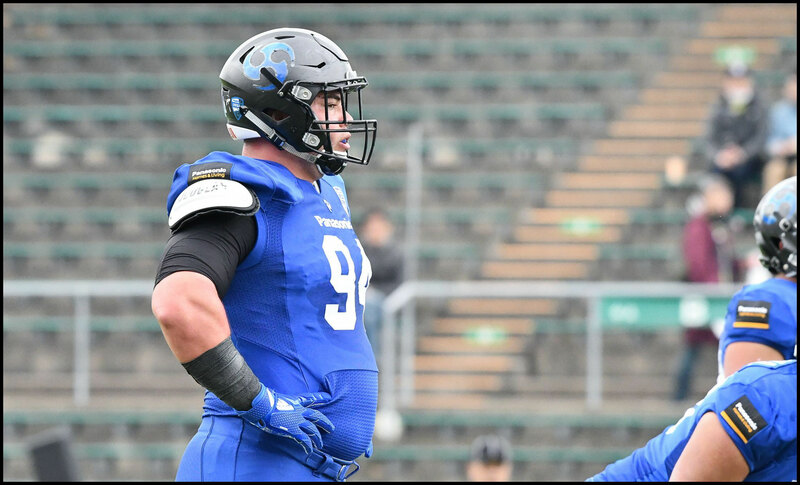 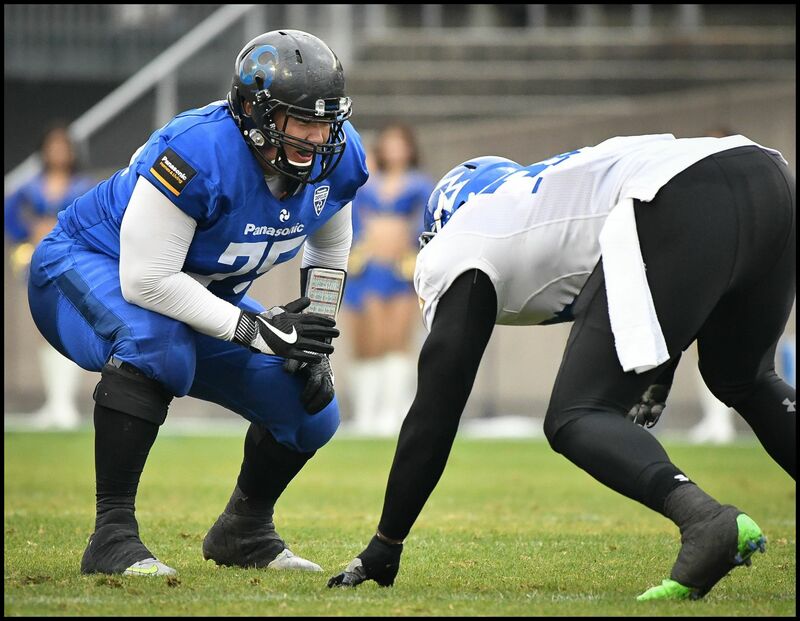 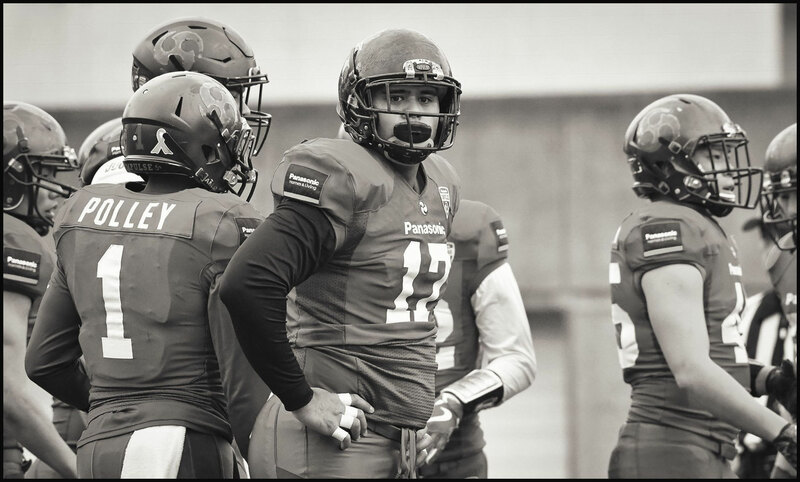 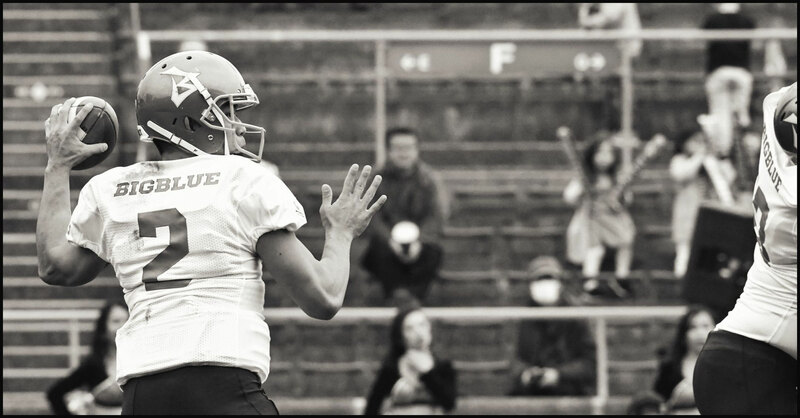 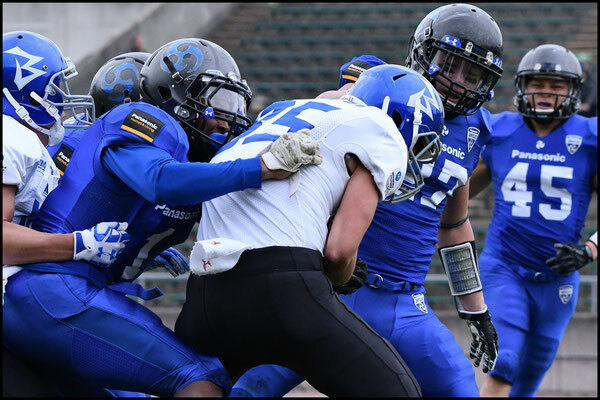 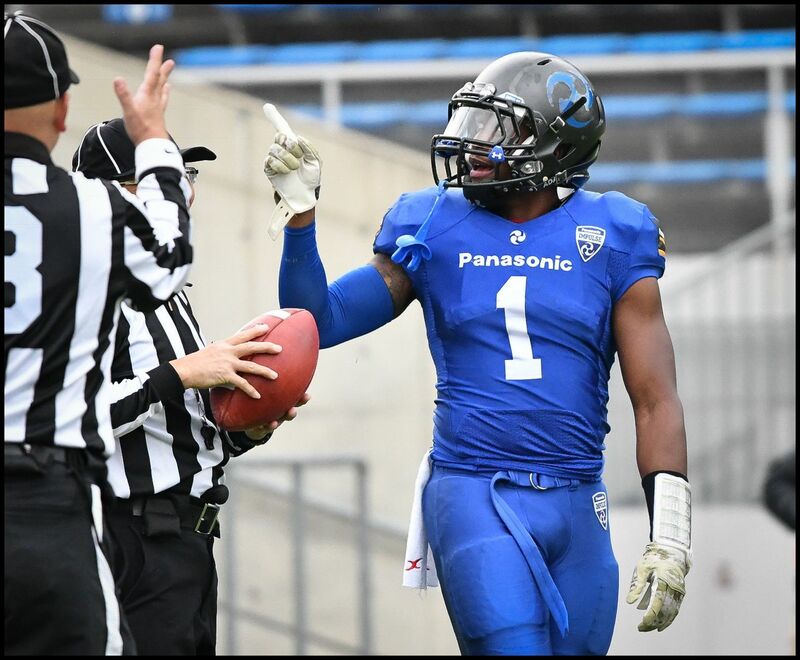 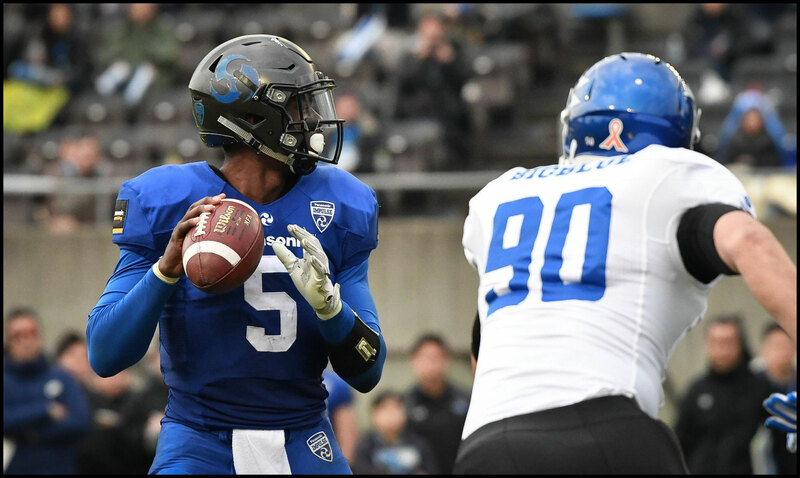 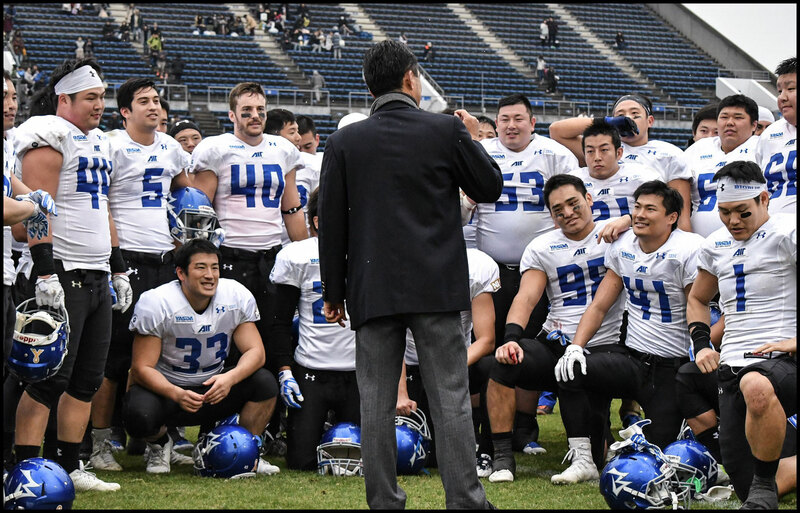 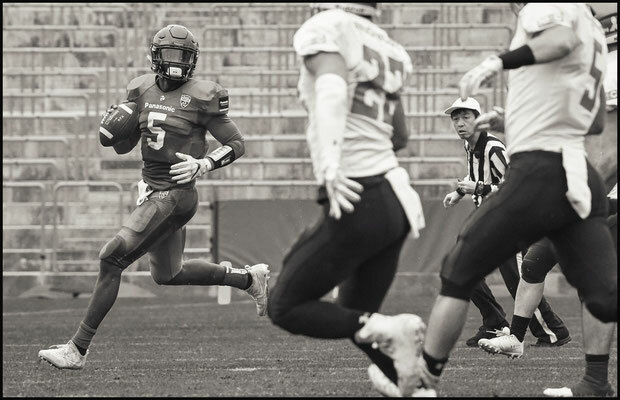 IBM Big Blue pulled off a stunning 31-24 upset of previously unbeaten Panasonic Impulse in a Japan X Bowl semifinal on November 26th. 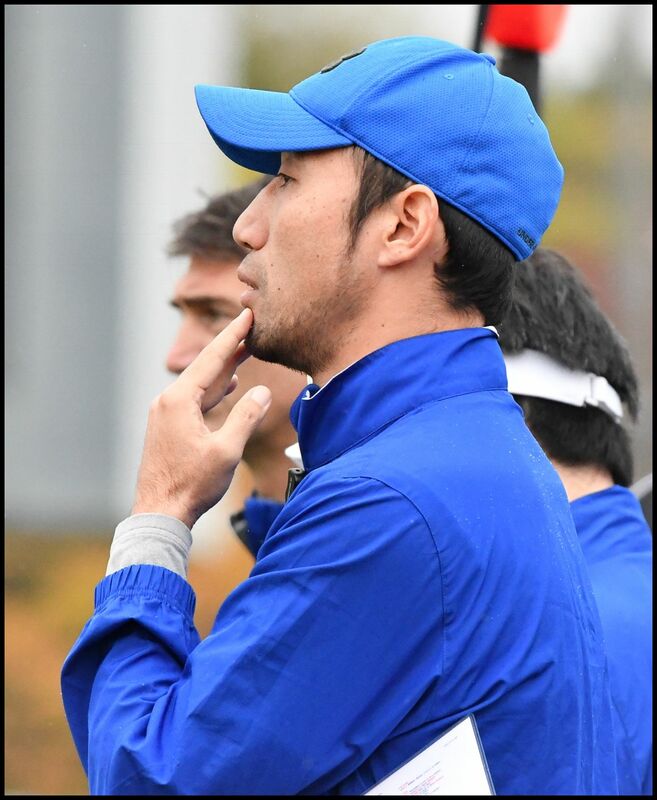 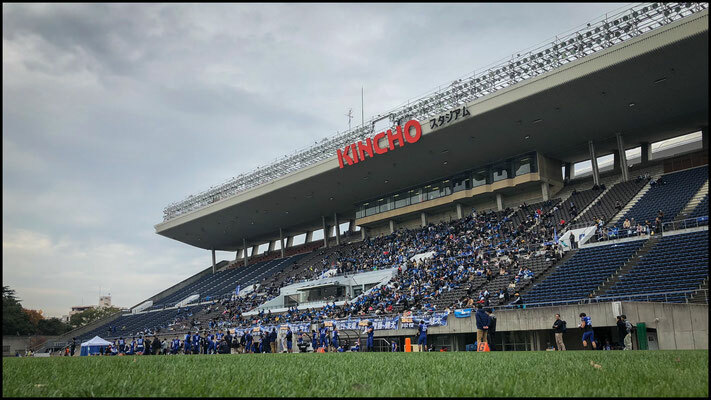 At a rainy Kincho stadium in Osaka, Big Blue exposed the one potential weakness we highlighted pregame - namely Panasonic’s ability to keep up in a high scoring shootout with a top team. 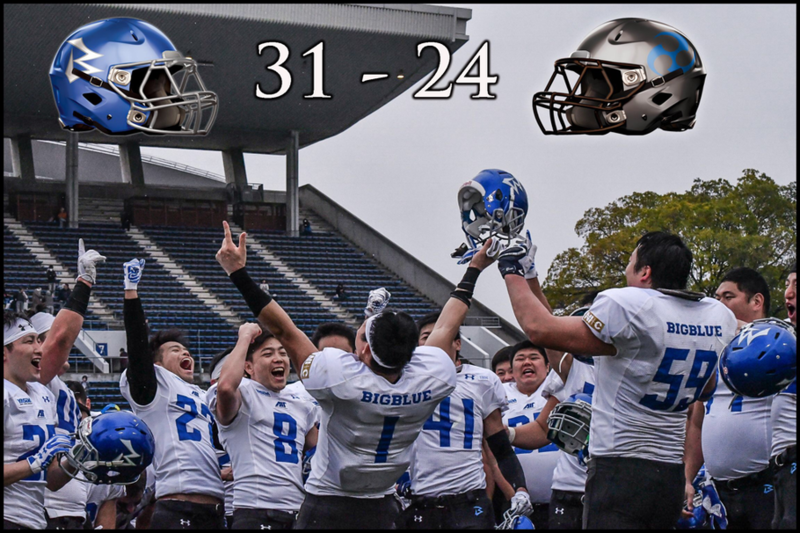 Quarterbacks Yuki Masamoto and Kevin Craft combined for 270 passing yards and four touchdowns as IBM overturned a first half deficit with a blitz of big plays in the third quarter. 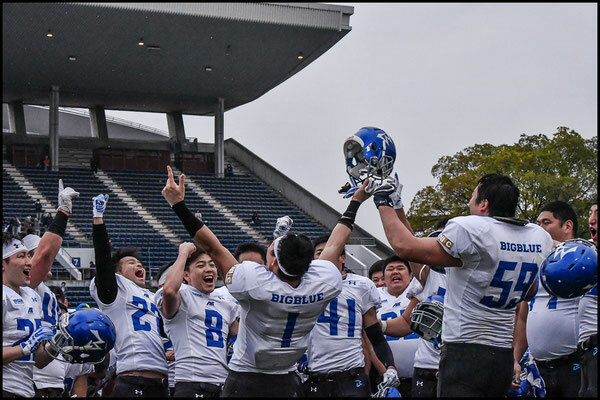 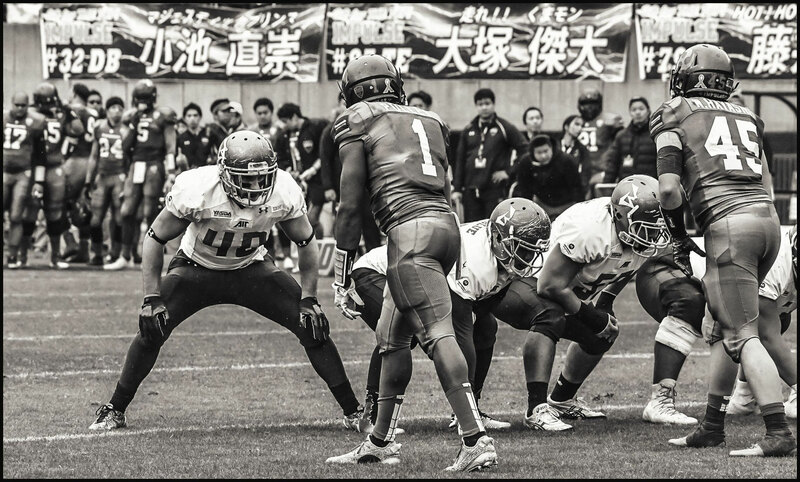 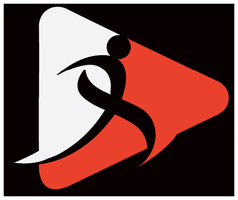 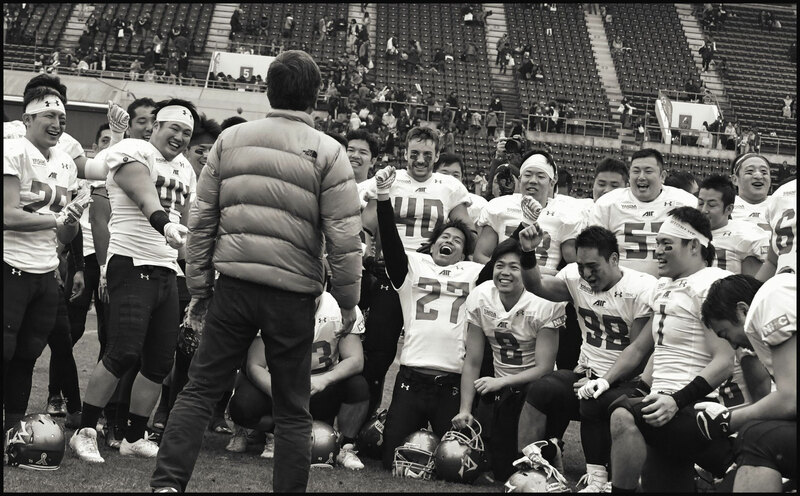 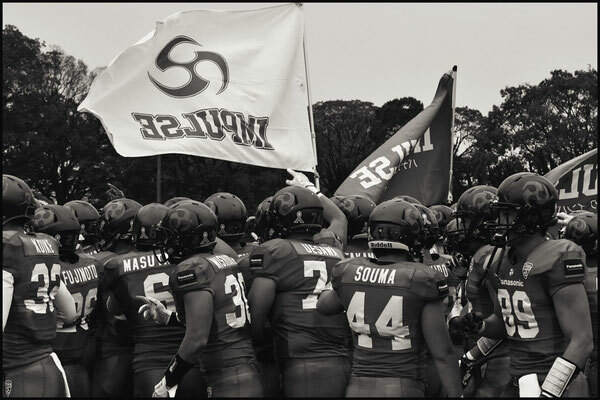 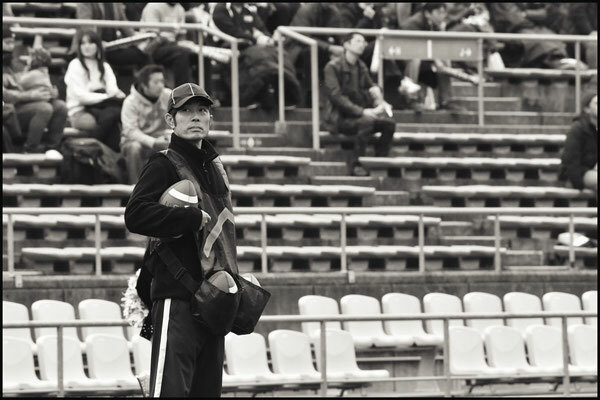 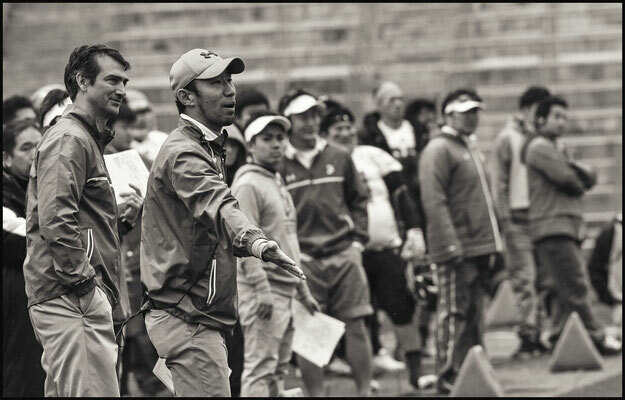 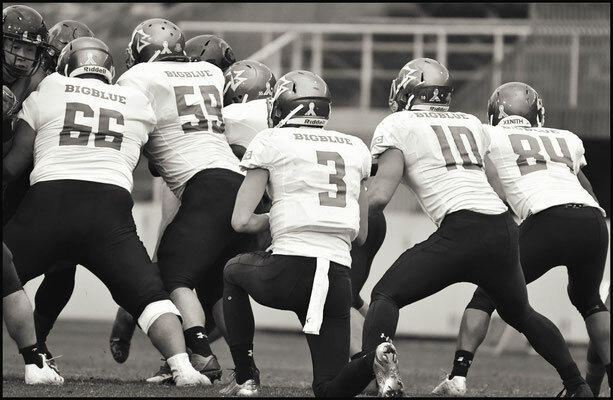 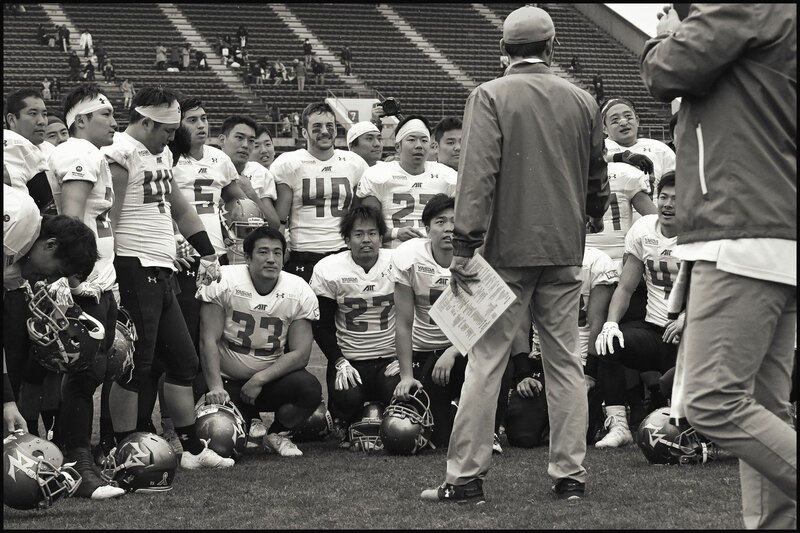 The signal callers, free of the injuries that hindered their mobility during the second half of the season, led the Chiba based side into only their second ever Japan X Bowl and will be hoping to claim a first title when they meet Fujitsu Frontiers in a rematch of the 2014 final on December 18th at Tokyo Dome. 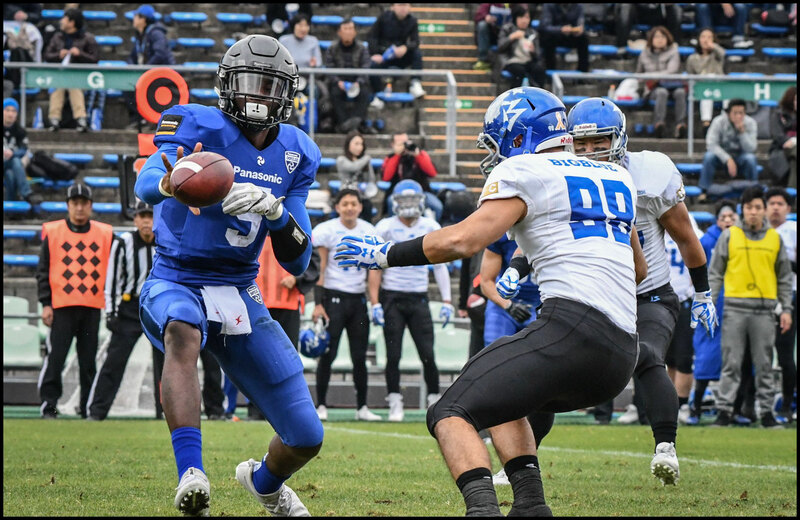 Masamoto showed early how dangerous he can be when fully mobile by evading a Carlton Jones tackle attempt on a six man blitz, spinning out to his left and galloping downfield for a 20 yard gain. 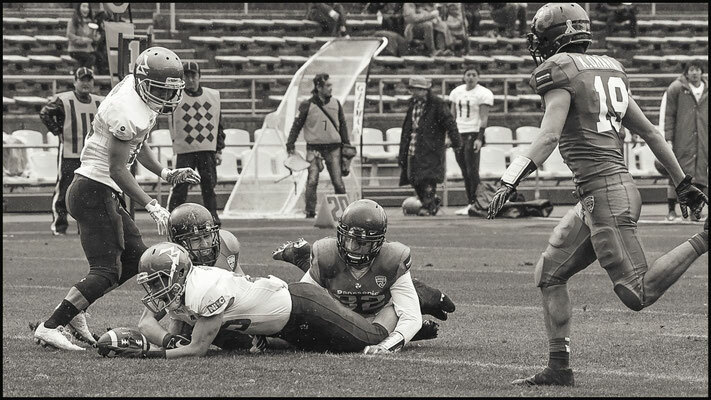 Two plays later he scrambled 11 yards up the middle for another first down. 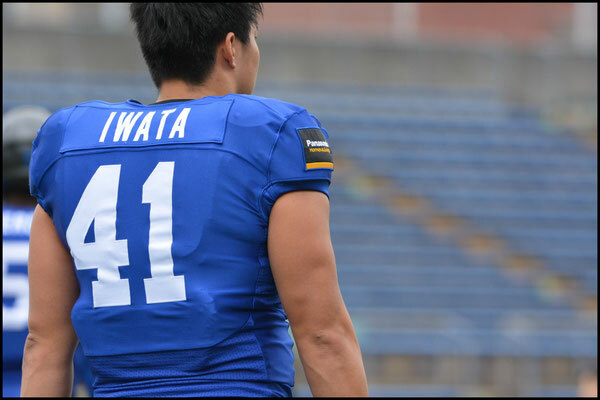 The southpaw opened the scoring with a TD pass to Takashi Kurihara streaking down the right sideline. 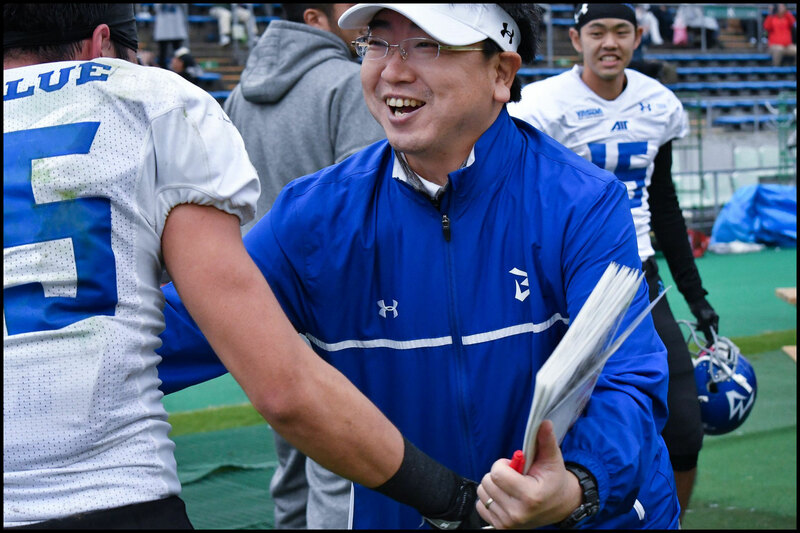 Masamoto who played all but two series in the spring Pearl Bowl has shown his development over the year and called the scoring play himself. 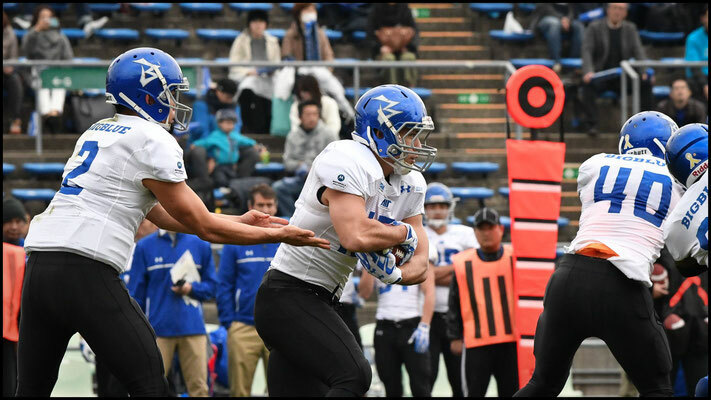 Panasonic needed only six plays to draw level. It would have been just three had a 67 yard TD run on a read option play by Shun Yokota not been nullified by a needless block in the back penalty downfield by WR Takato Kido. 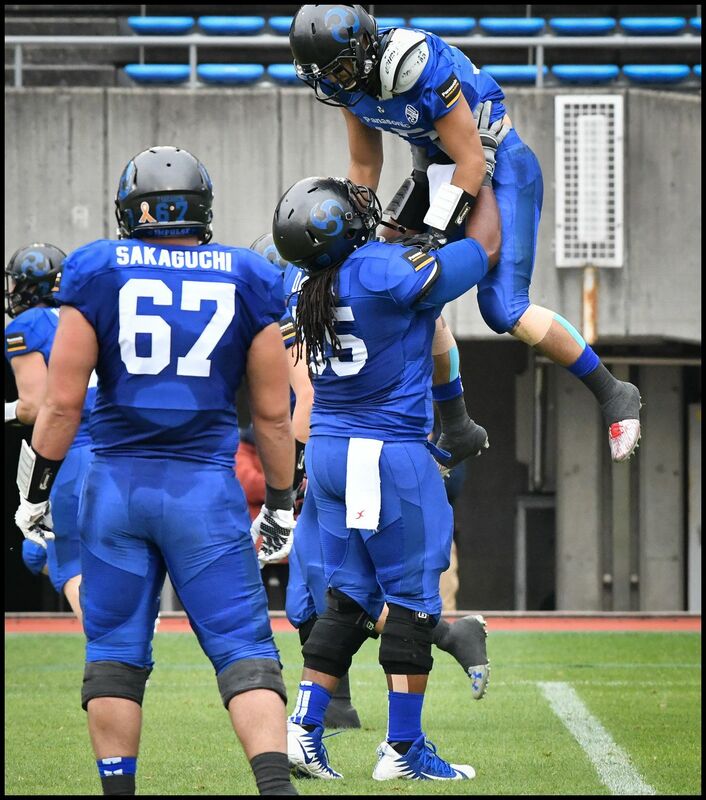 Kido redeemed himself on the very next play though hauling in a deep pass from Koji Takagi after the wideout had taken a lateral from QB Benjamin Anderson out near the left sideline and sucked in all the defenders. Kido was actually wide open and if the pass had just been a couple of yards longer it would have been a TD. 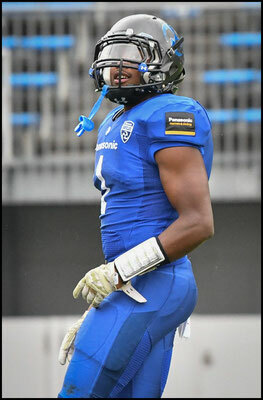 The home side's opening score came two plays later when Anderson did his patented shoulder shimmy, motioning as if he were going to pass to Kido then floating one in behind Takayuki Yoshimura to WR Taiji Koyama. 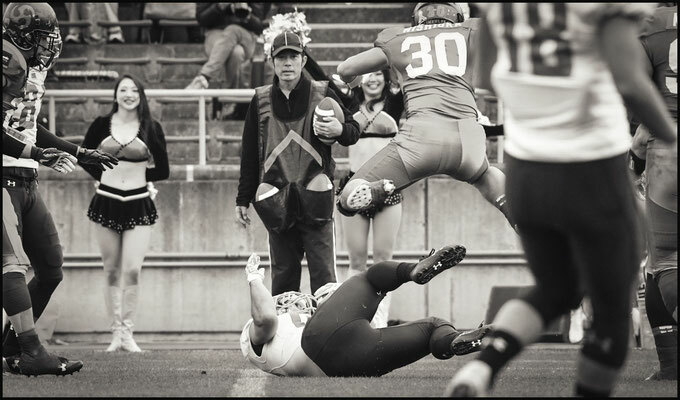 Anderson does that pump fake as well as anyone. 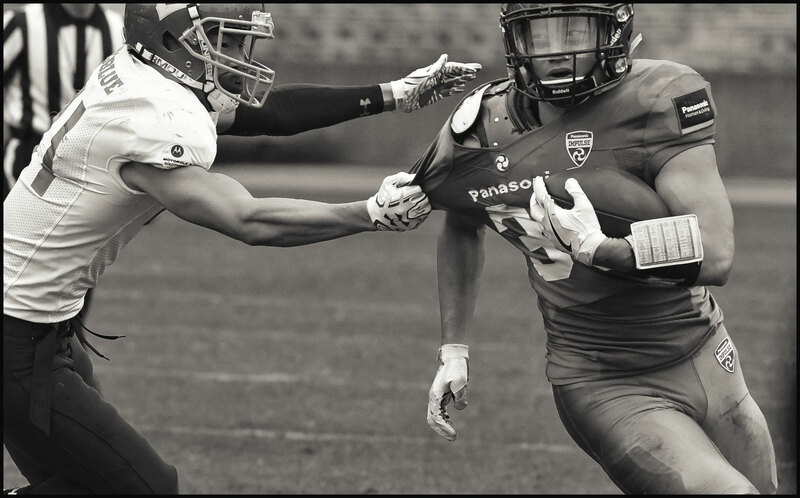 There is real economy of movement and it requires almost no reset to hit the second or third man in the progression. It's a big reason the newly named 2017 XLeague MVP had gone all season without an interception. 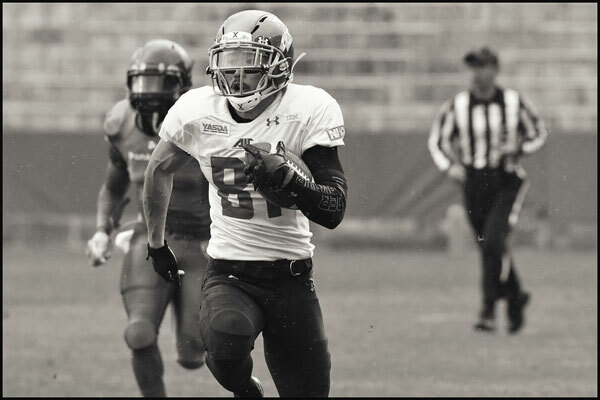 He is able to redirect the defensive backfield with ease leaving his intended targets open or in single coverage. 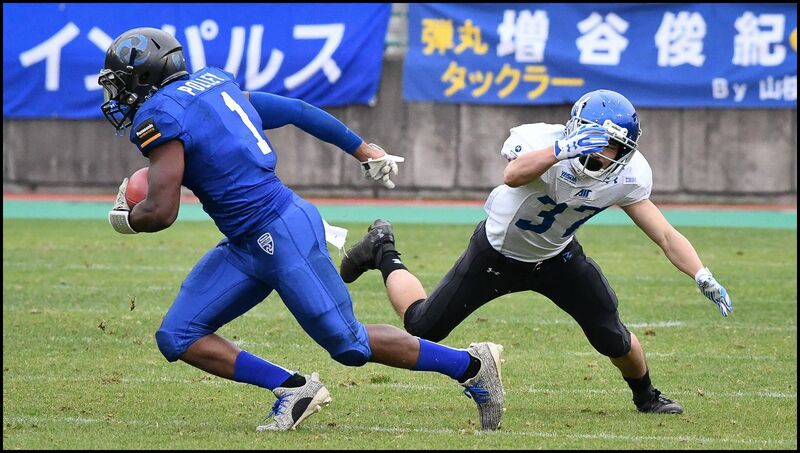 Masamoto continued to play well getting the ball out quickly. 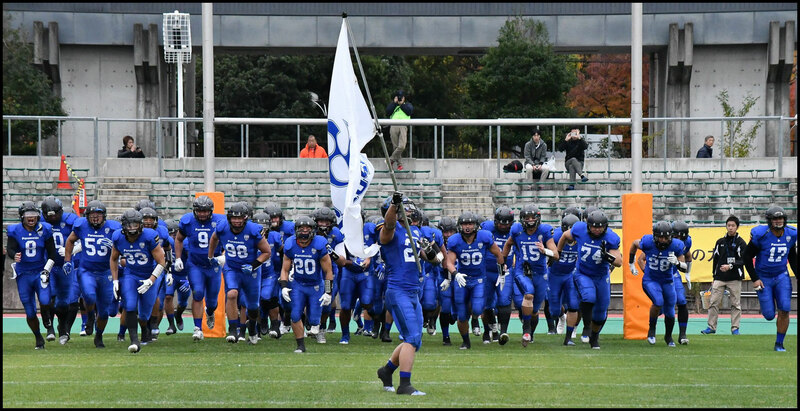 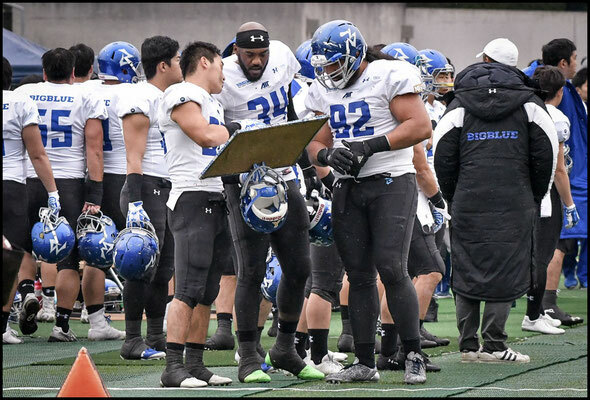 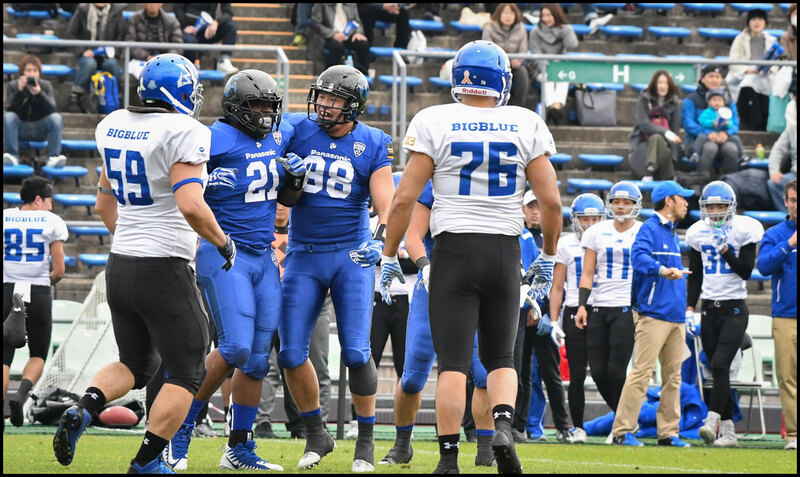 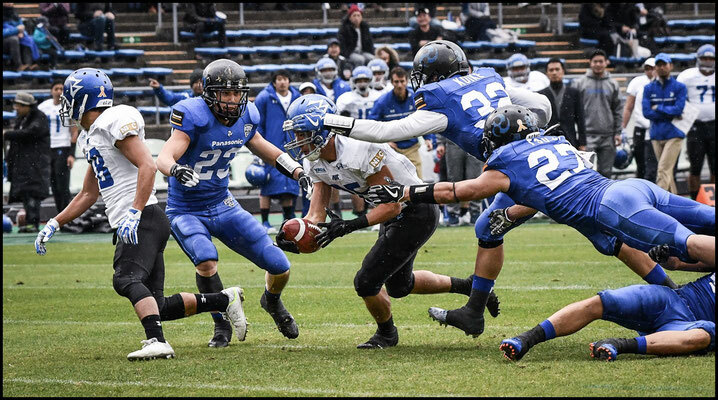 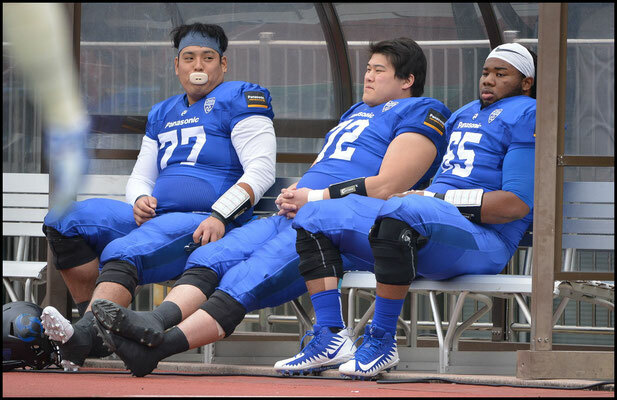 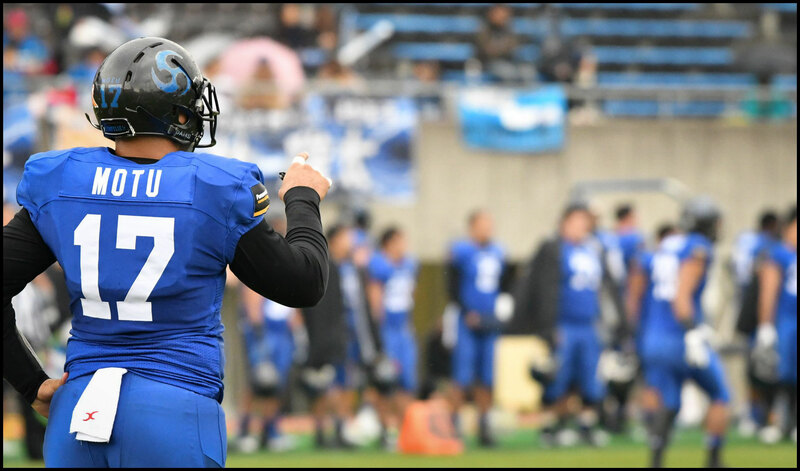 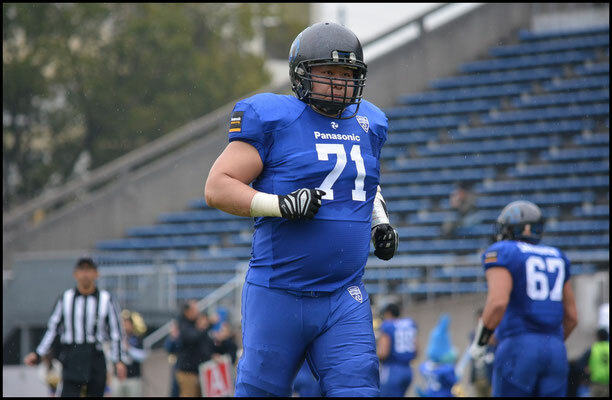 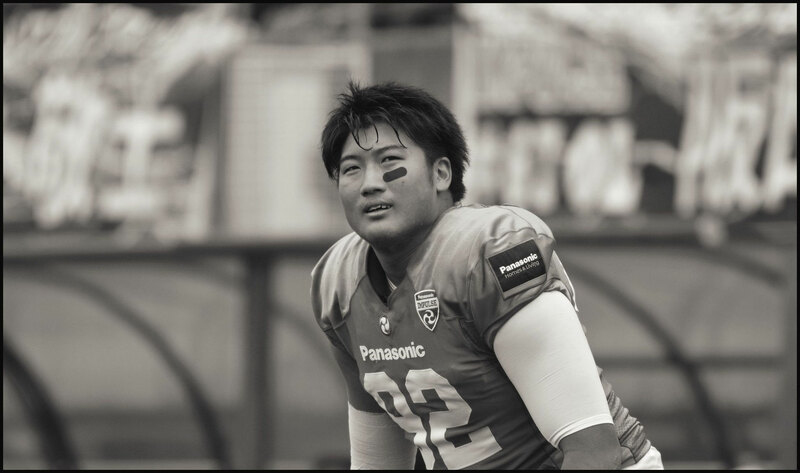 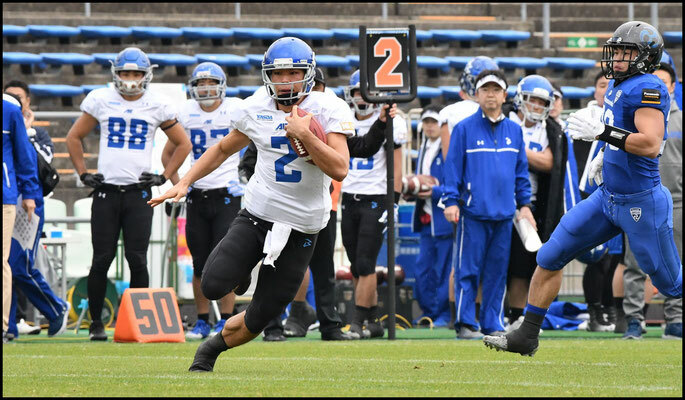 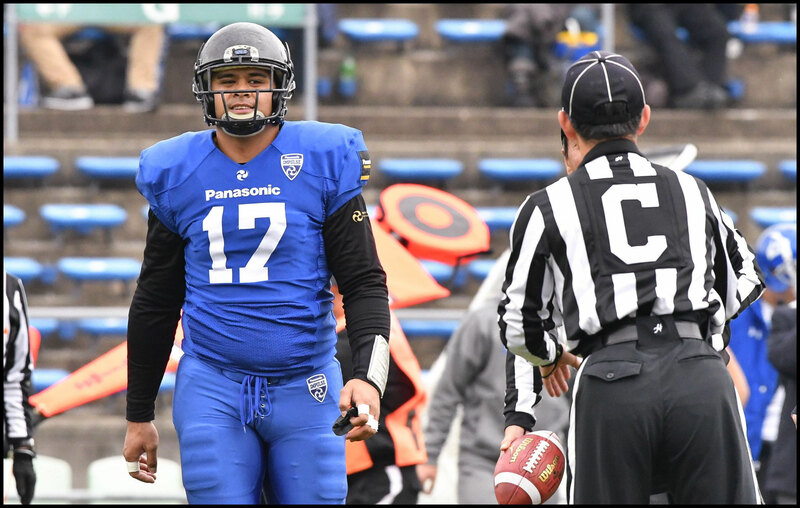 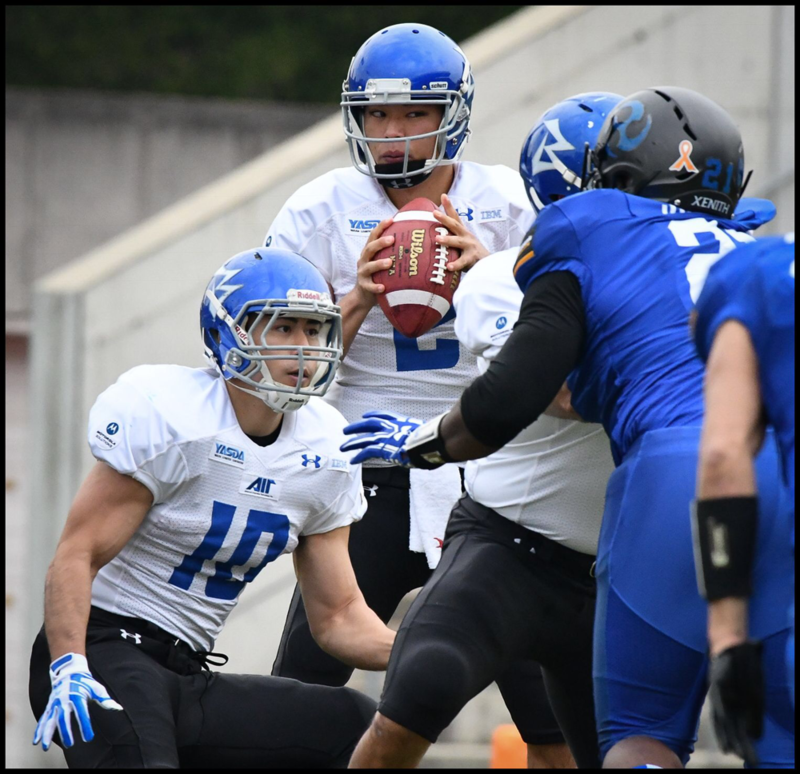 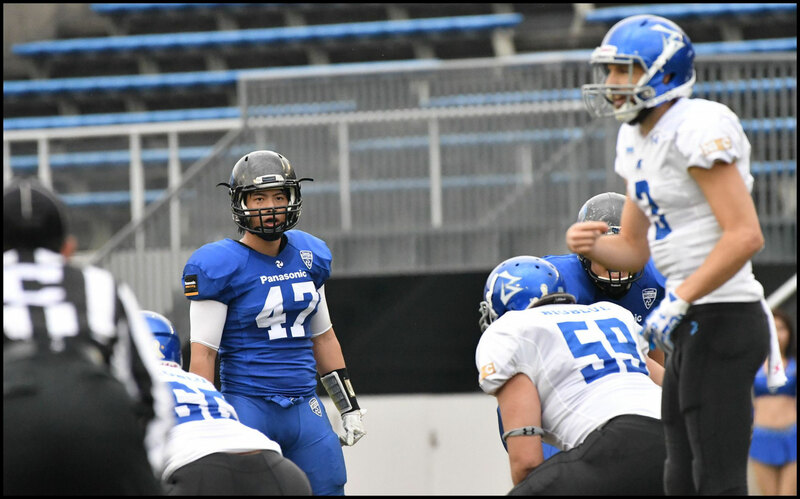 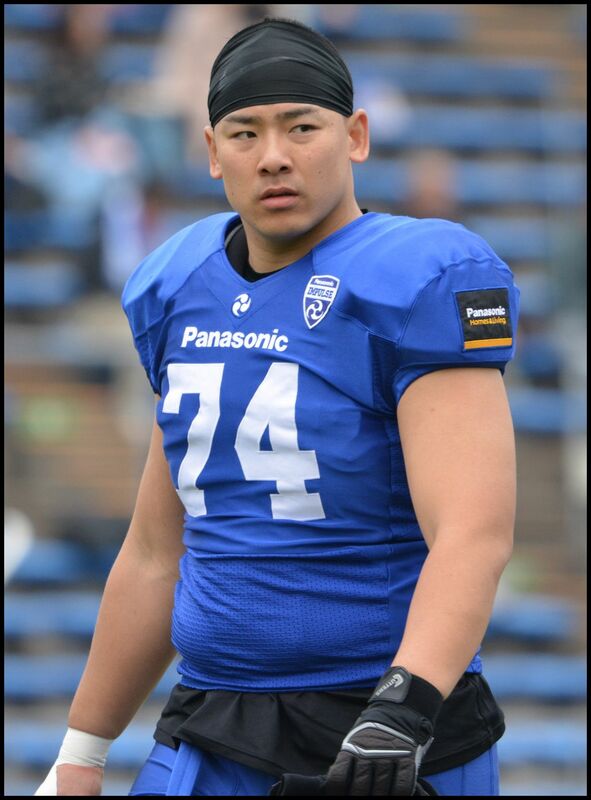 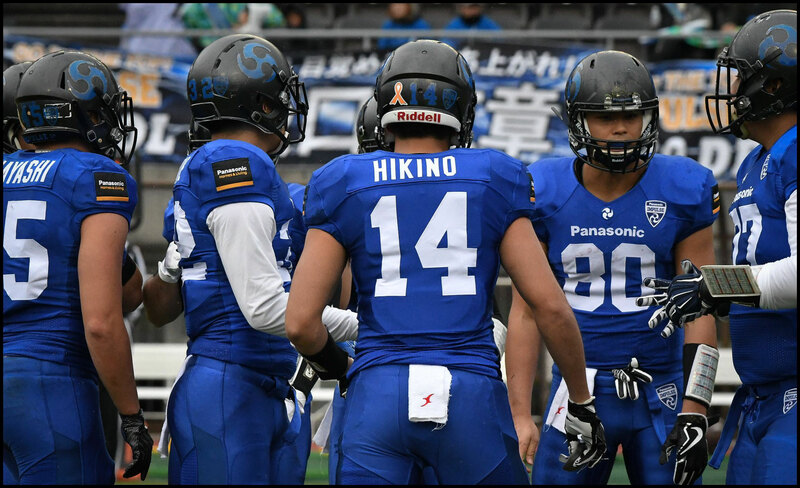 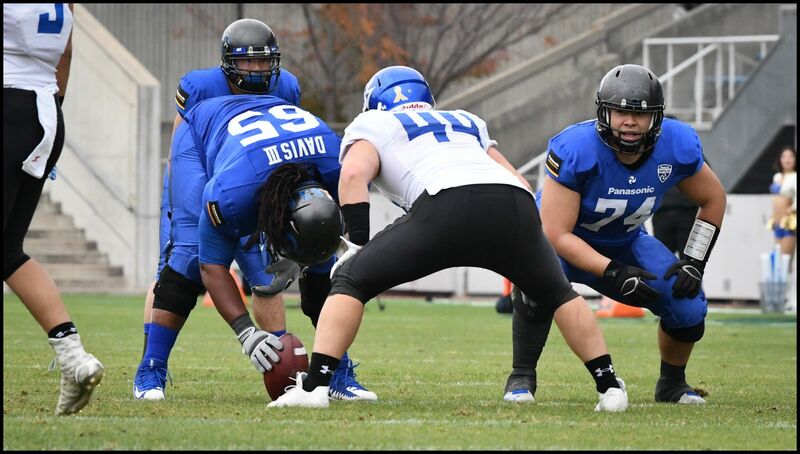 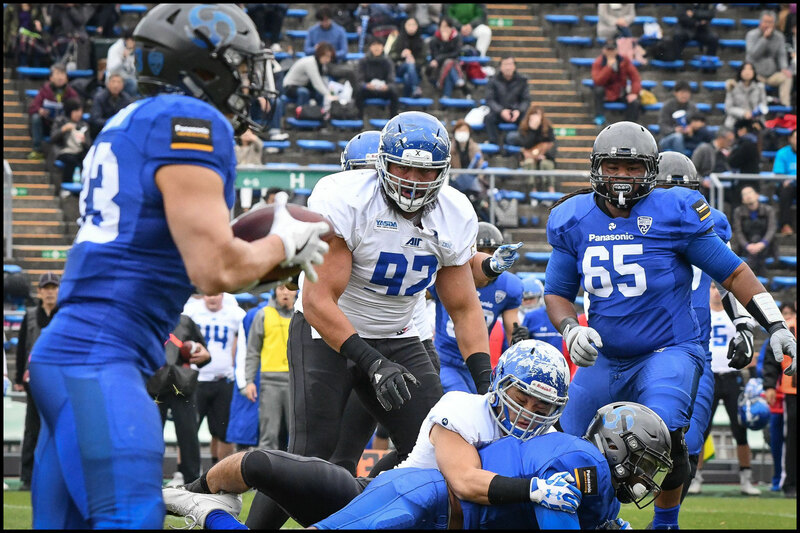 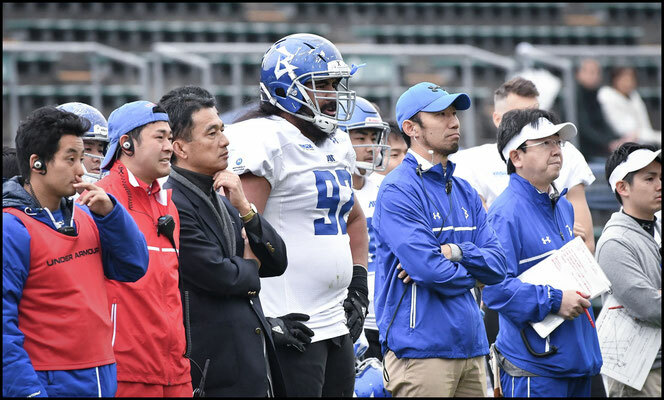 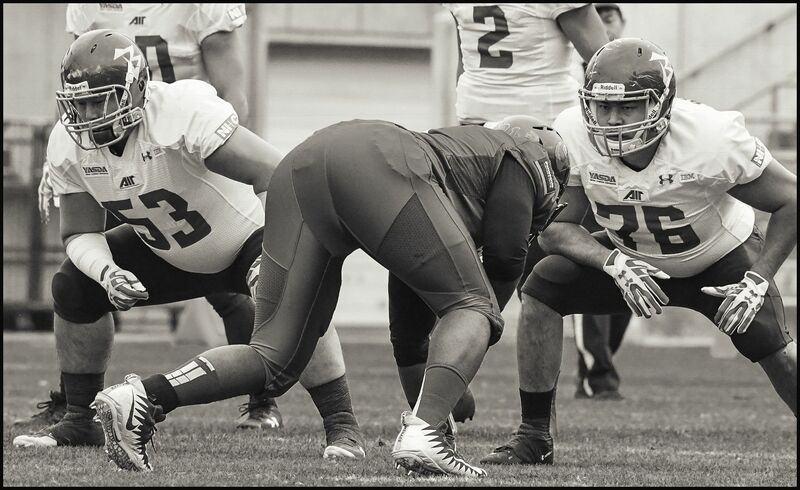 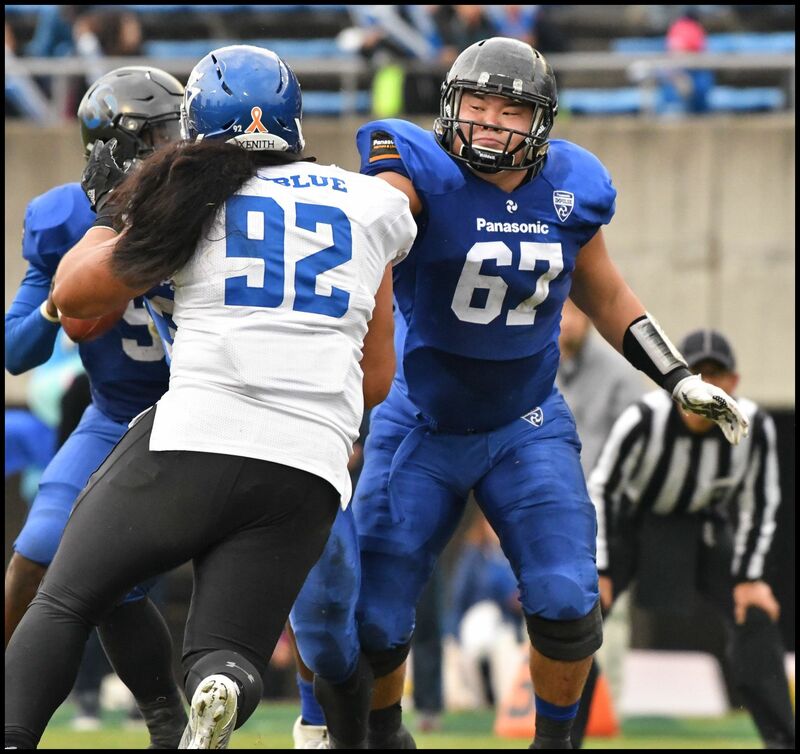 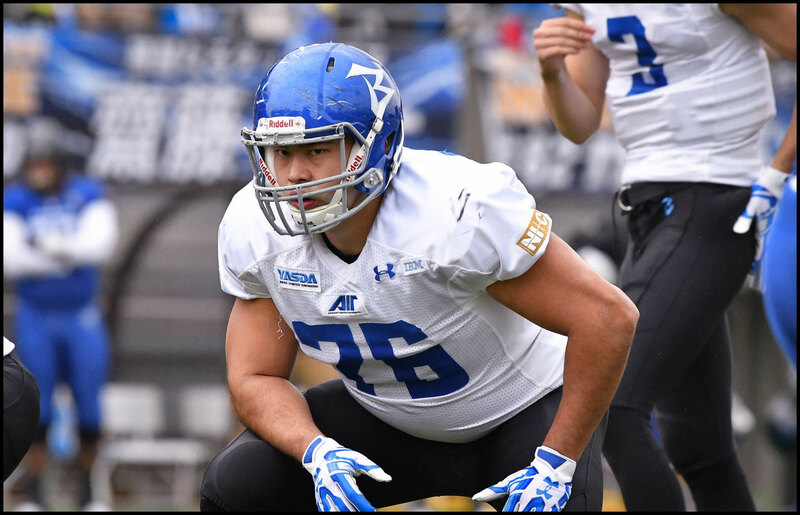 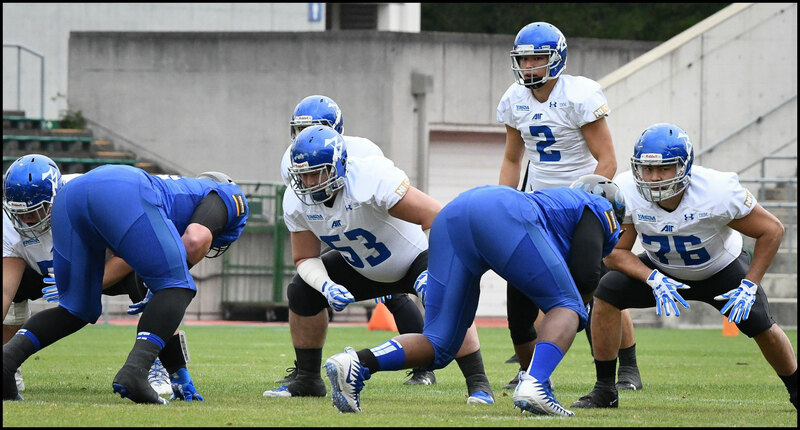 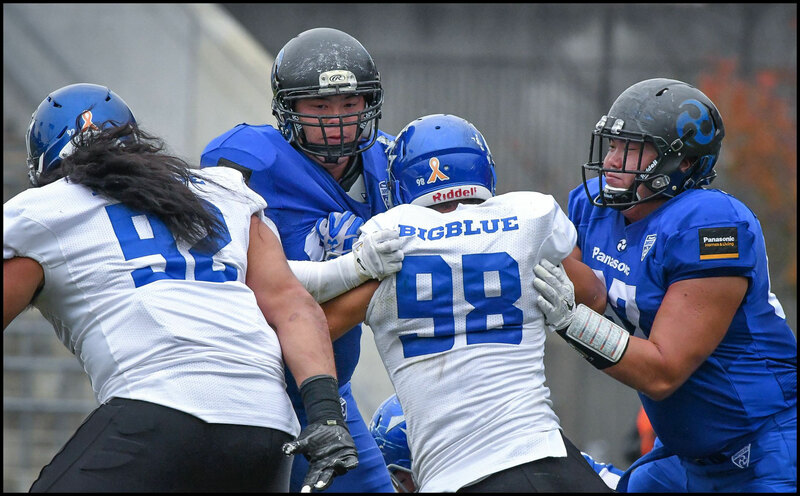 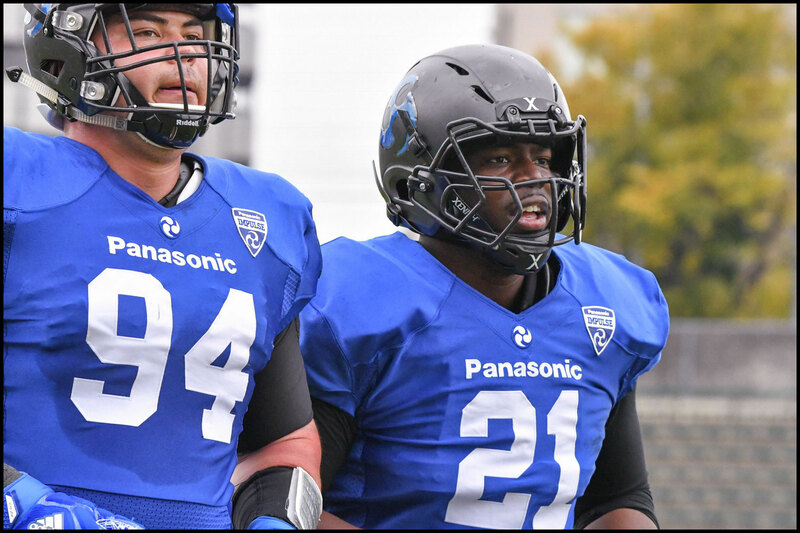 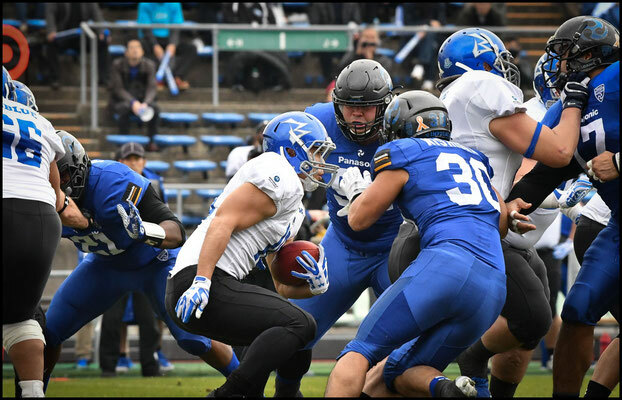 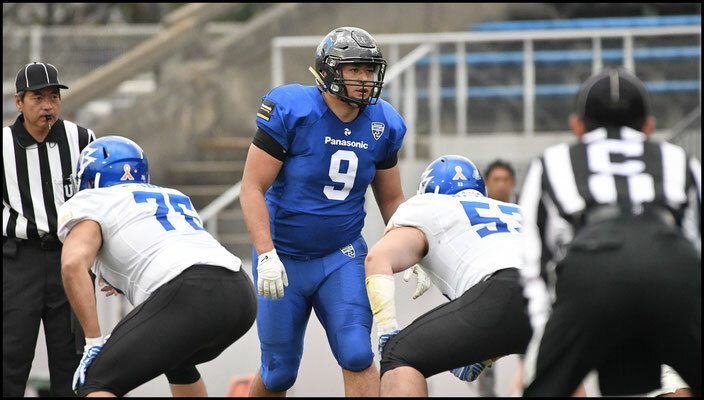 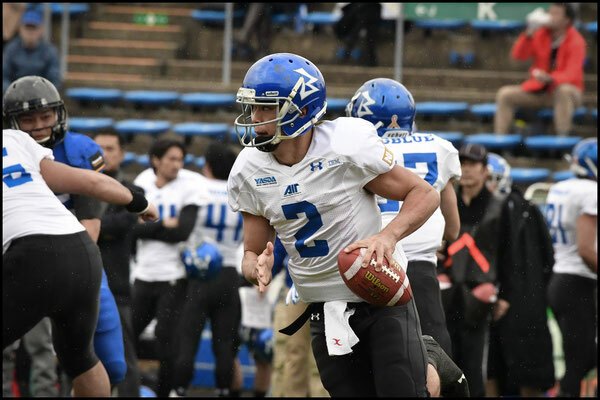 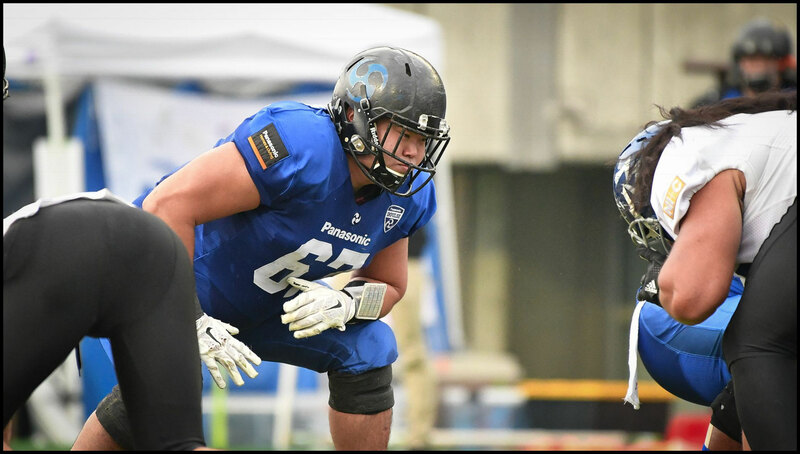 Big Blue's offensive line was doing a good job picking up a standard rush and when Panasonic brought pressure Masamoto punished them with quick passes. One to TE John Stanton was caught 4 yards downfield, and the All-Leaguer tacked on ten more by breaking one tackle and ploughing into another two defenders. There were lots of seesaw battles going on all over the field. 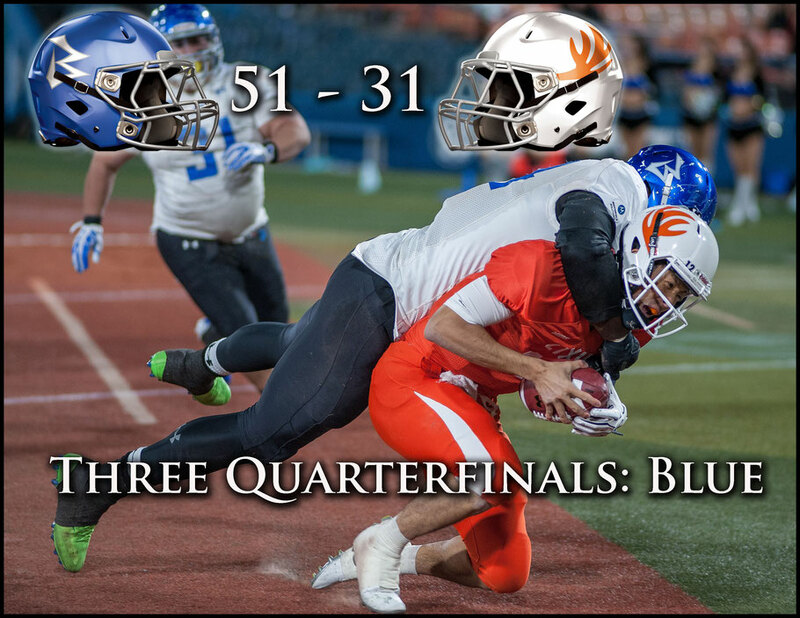 One play after Kevin Coghlan tipped an Anderson pass incomplete the QB juked the linebacker for an 8-yard gain. 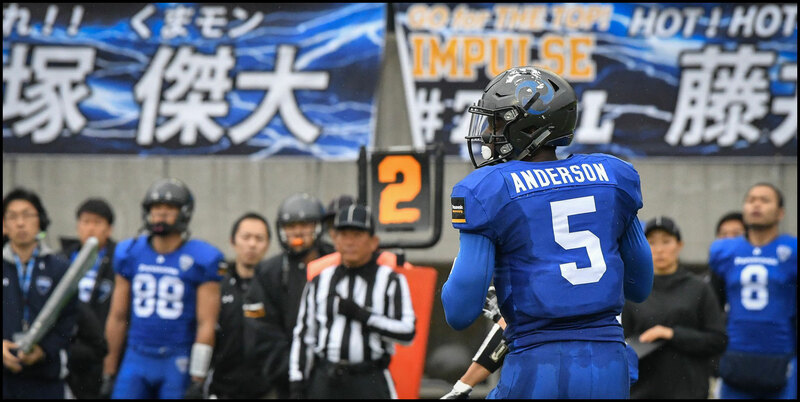 Anderson gave Panasonic the lead in the second quarter. With Yokota going right to left at the snap and sucking in DB Shogo Nakatani as well as Coghlan, Anderson hit WR Shohei Kishimoto with a bullet down the middle for the 24-yard score. 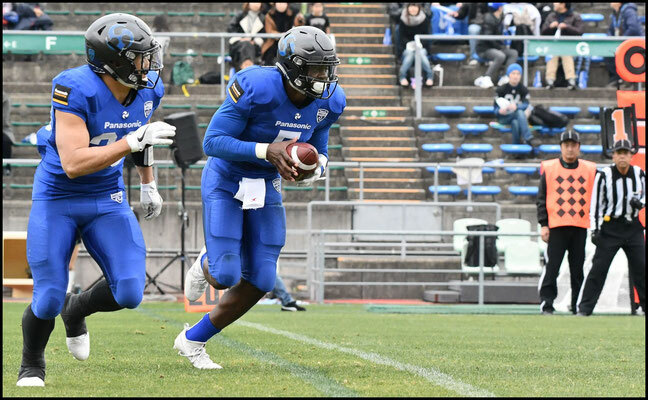 Impulse DL Carlton Jones then put an end to the subsequent IBM drive, forcing a three and out when his speed allowed him to come in from the left side up through the middle and sack Masamoto as he scrambled out the opposite direction. 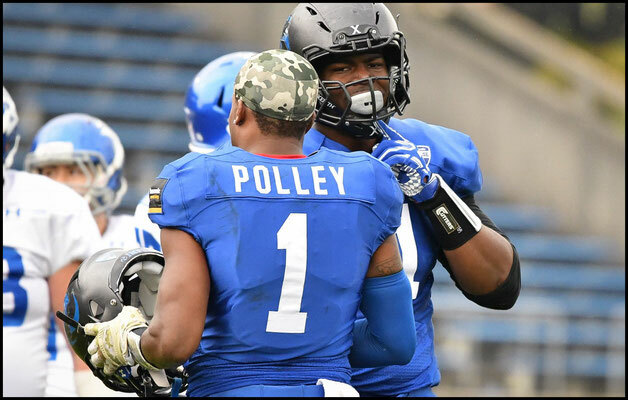 Jones was also named to the just announced All-League team for the first time. 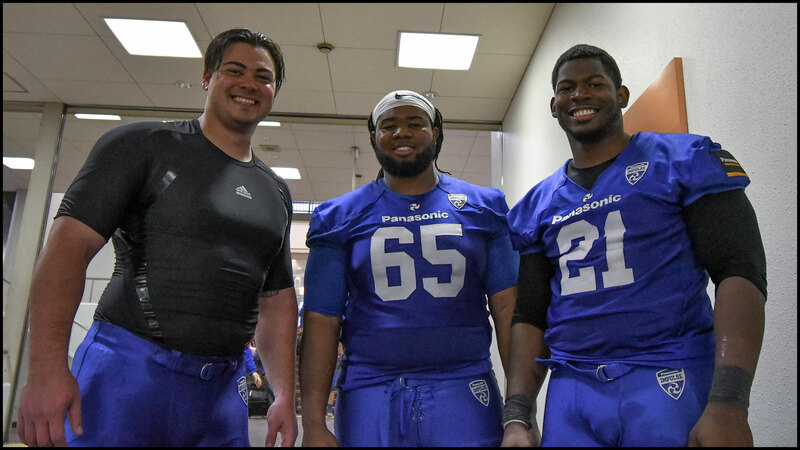 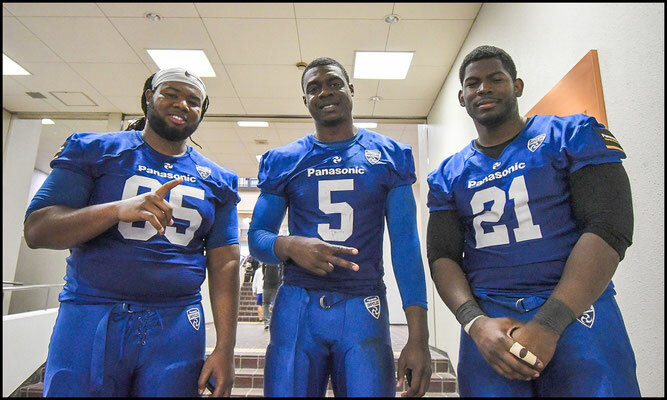 All four of Panasonic's American players were honored this season. 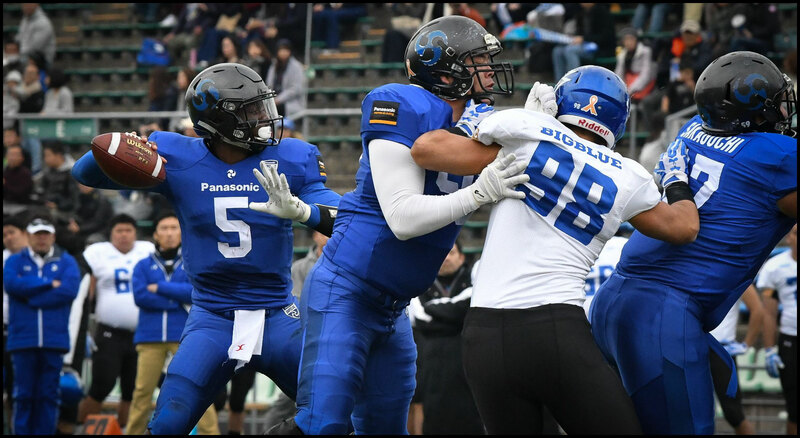 IBM’s DL too started to assert itself more at the end of the first half with Anderson barely managing to throw a pass away on one play and a botched snap later forcing them to settle for a FG. Jones again put paid to an Big Blue drive with a big sack up the center. 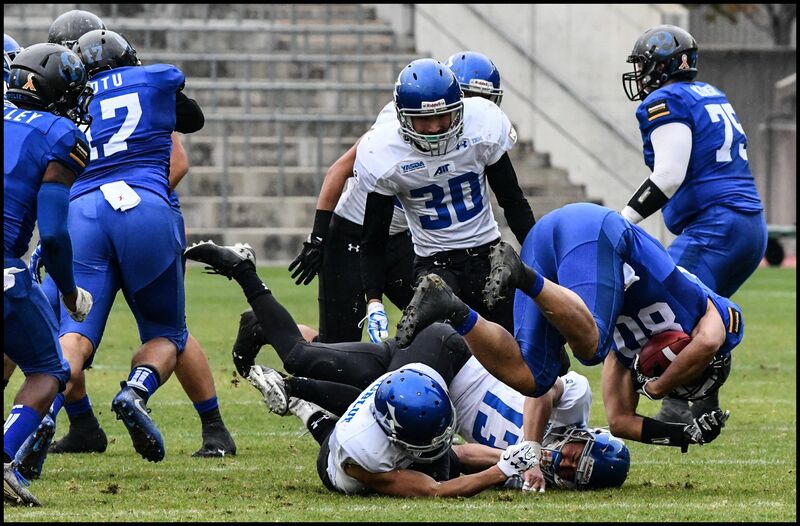 This time he came around from the right side up the middle. IBM got a field goal out of the possession though and that made it 17-10 at the half to Impulse. On the ensuing kickoff Genki Odakura ran at the ball like normal before slowing at the last second and chipping an arching onside kick 15 yards up the right sideline to Nakatani. So perfect was the kick that there wasn’t a Panasonic player within 5 yards of him when he caught the ball on the fly. 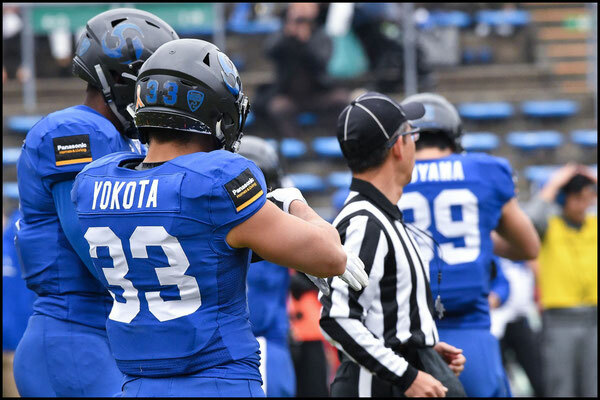 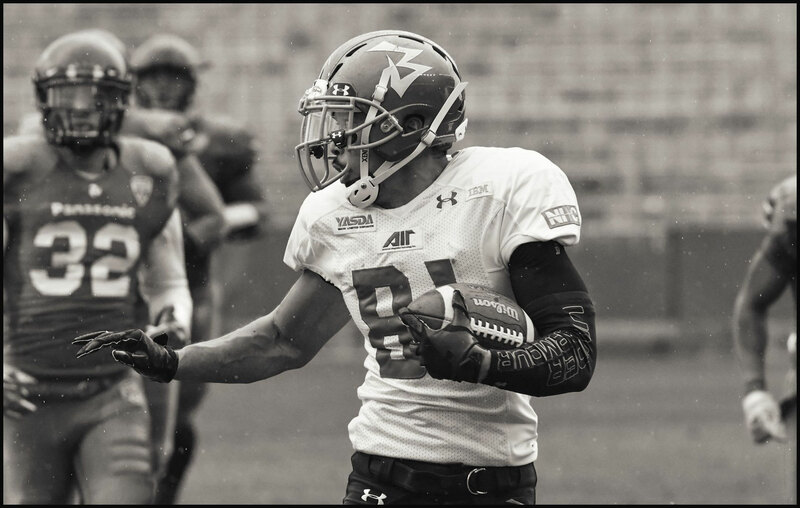 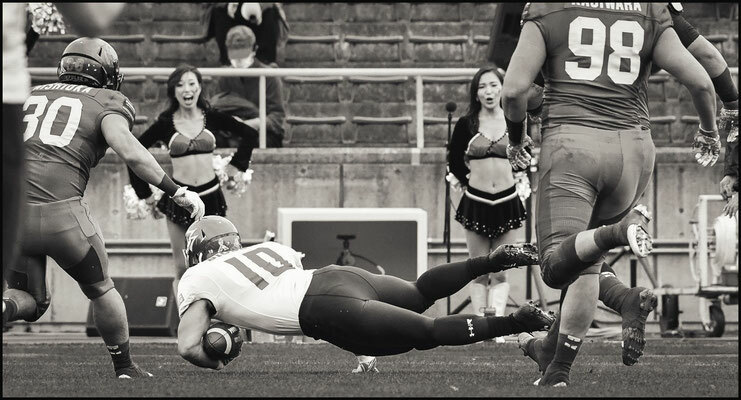 Six plays later Craft dropped a pass to Stanton just in over the outstretched hands of Keita Suzuki and the St. John’s University man evaded three tacklers for the score. 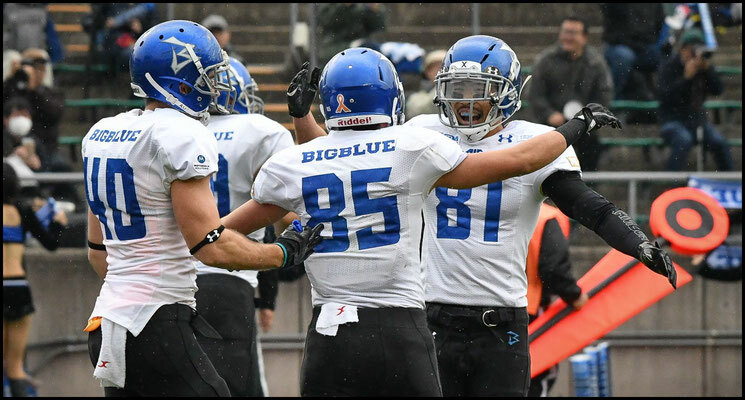 In the space of two and a half minutes Big Blue had gone from ten points down to seven up and the upset seemed to be on the cards. 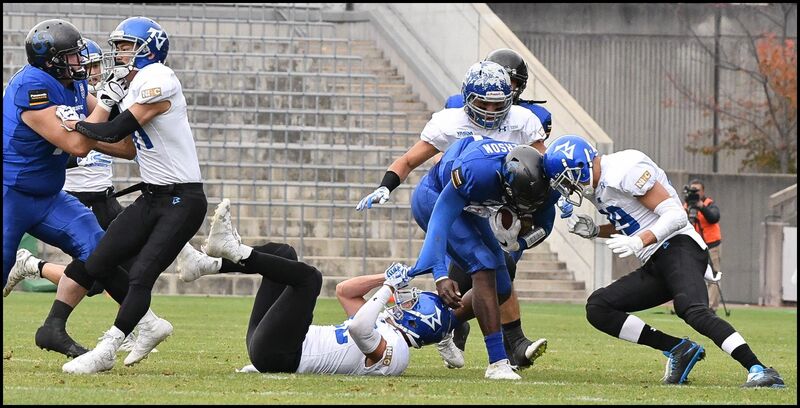 Not that the game was over by any means. 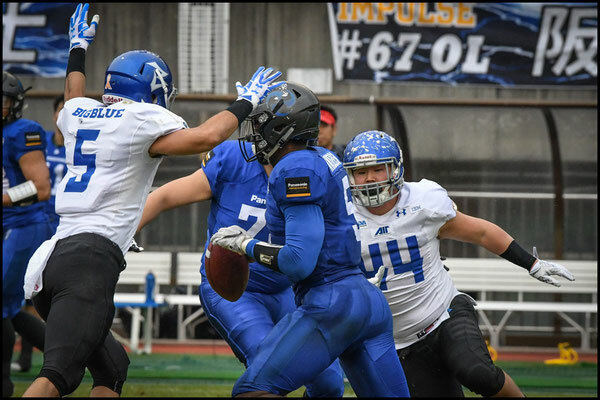 Late in the third quarter Impulse standout DL David Motu hit Masamoto as he threw and Shogo Matsunaga jumped the route of Atsushi Uehara coming across the middle for the interception. There was no way the shorter Masamoto could have seen the LB especially with Motu in his face. 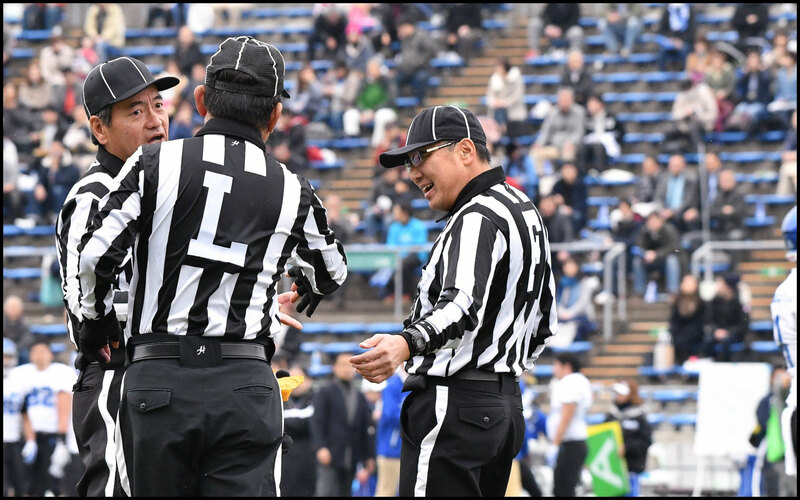 That turnover lead to nothing however as IBM got an immediate stop. 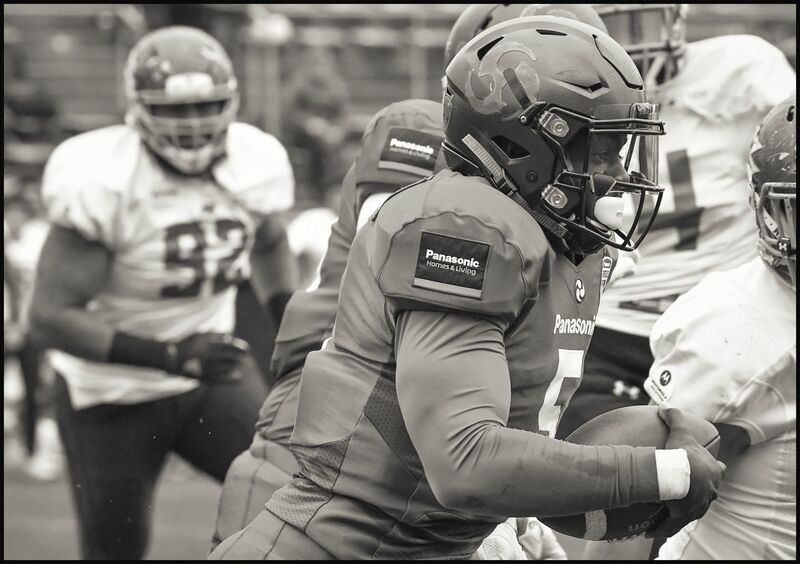 James Brooks driving the right tackle back and then knifing inside to tackle Anderson just short of the line on fourth down. 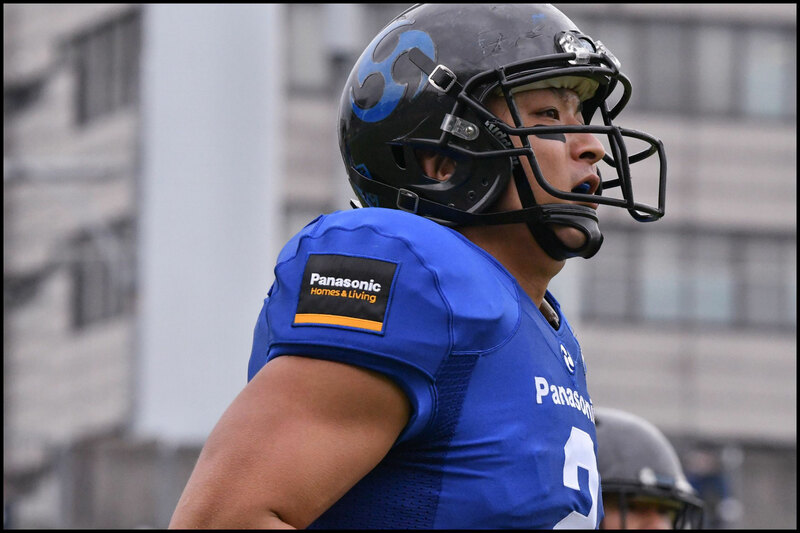 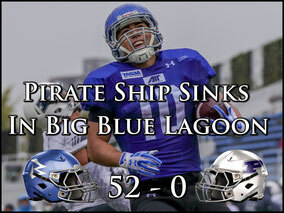 In the fourth quarter though Panasonic drew level. 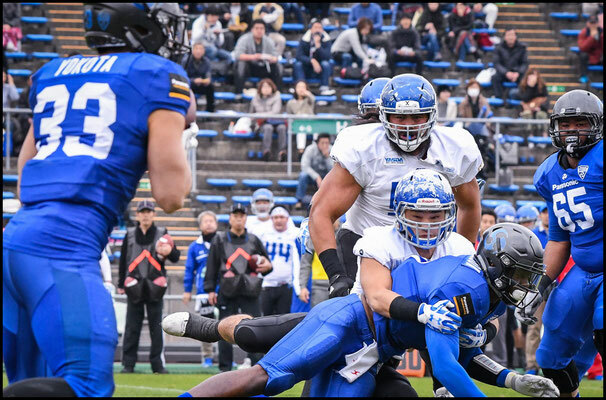 Anderson first hit Kido out right and the wideout rode a nice block by Koyama down right sideline for a big gain, then two plays later he pump faked to put off Hiroki Sakuma and found Tatsuya Tonka with a perfectly placed pass on an in and out route. Three possessions later Craft hit RB Tomokazu Sueyoshi on a wheel route lobbing the ball over the trailing Matsunaga for a deep gain down the right sideline. 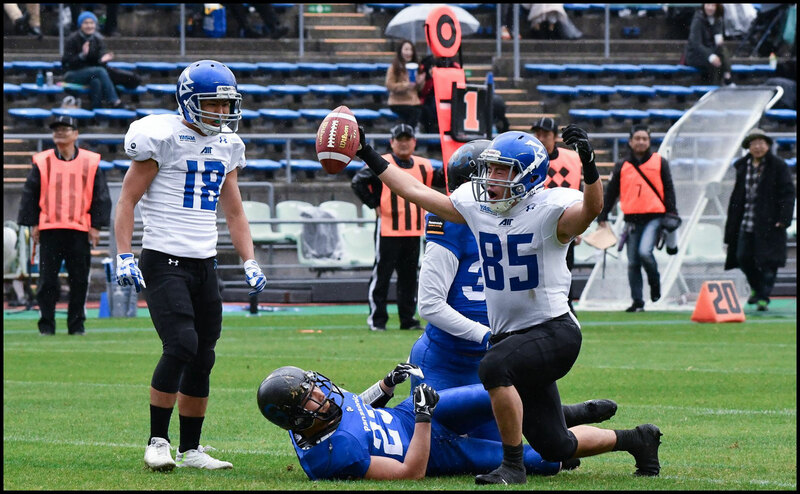 On the very next play Craft put a deep arching pass out left where only Suzuki could get it for the TD that proved to be the final score of the game. 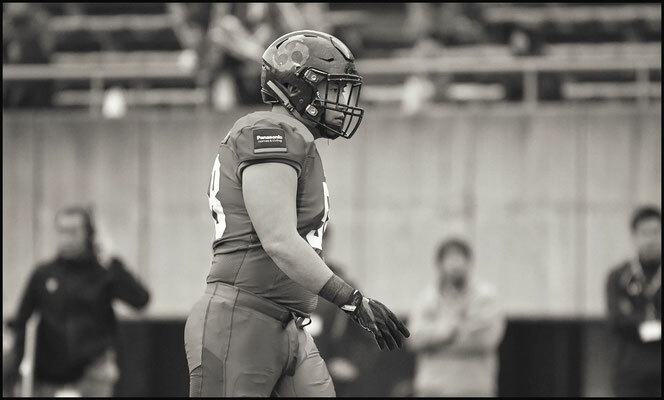 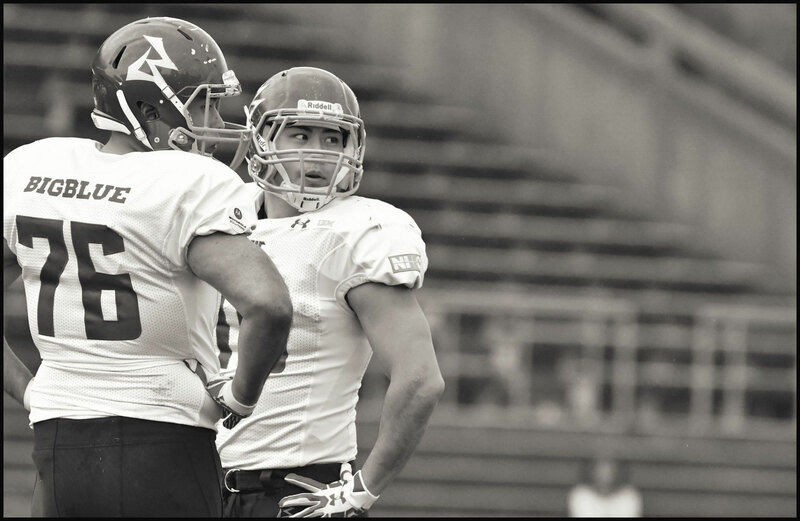 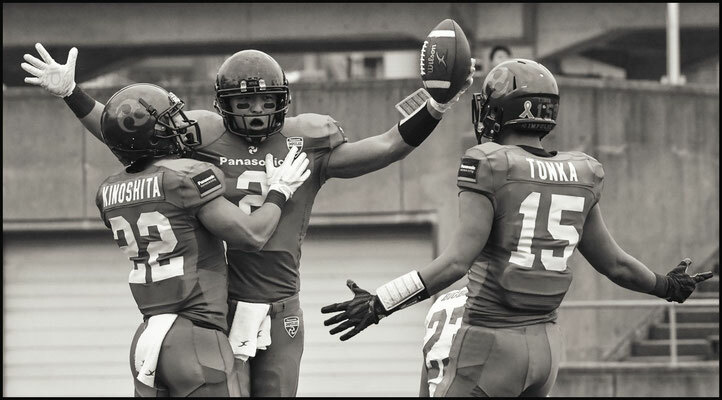 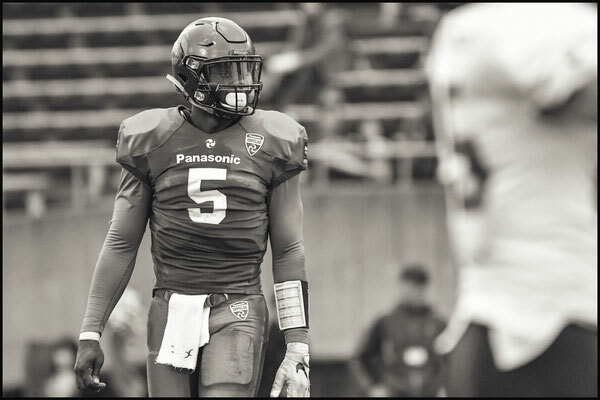 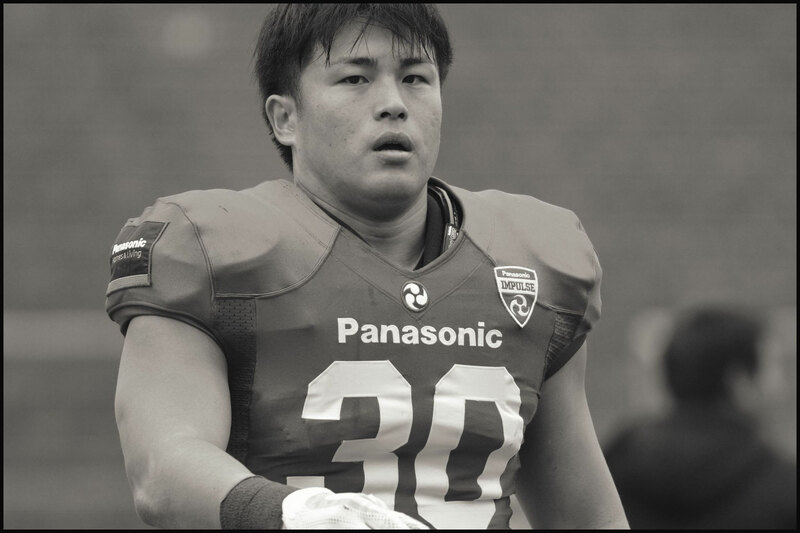 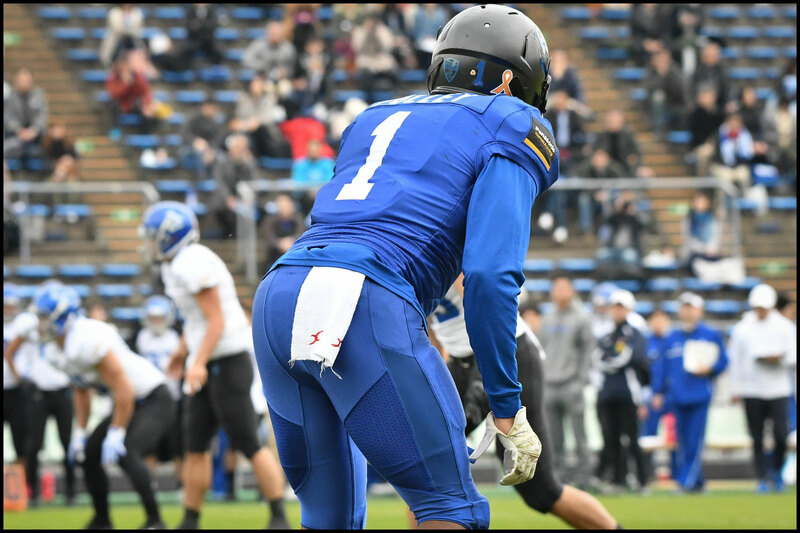 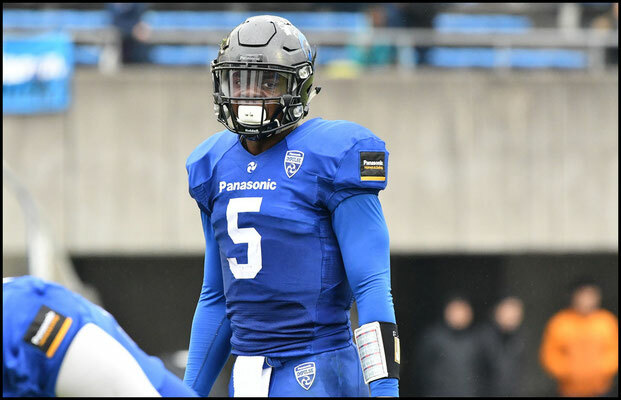 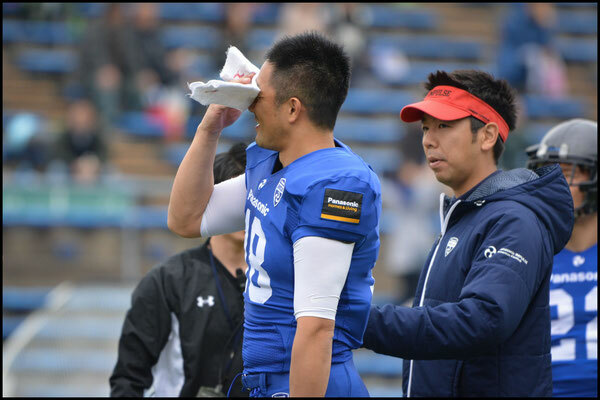 Anderson overcame two sacks and got a first down on a 4th and 1 but when he went deep down the right sideline to Kido, DB Kengo Teranaka was there to get the first interception of the season off the Panasonic man. Impulse got the ball back almost immediately however when Naotaka Koike ripped the ball out of Ryo Takagi's hands after the RB had gone on a long mazy run up the middle and Carlton Jones recovered. 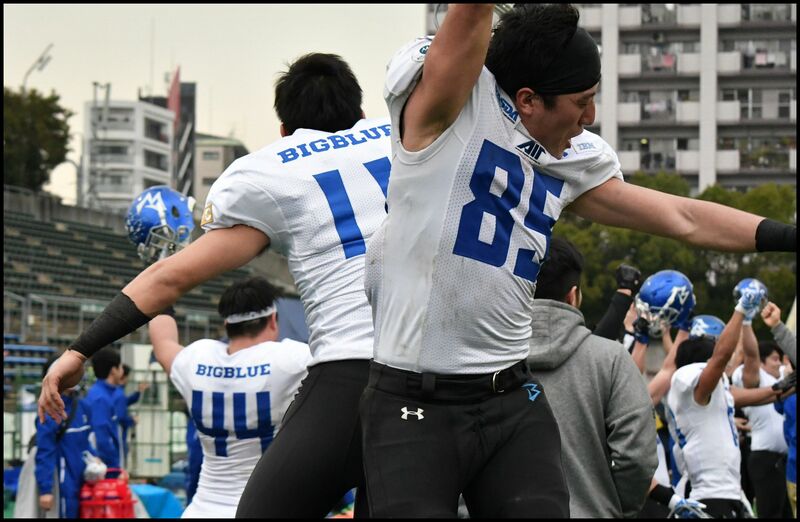 With just a minute and 29 seconds left Anderson took two deep shots that missed and when on third down he scrambled right to avoid pressure from Charles Tuaau and threw just beyond the first down marker, Tatsuma Kobayashi got back to the ball more aggressively to steal the pick that sealed the game and put Big Blue into the JXB. For Panasonic it's a bitter end to a season that saw them defeat three top sides in a row and go 7-0 before the semifinals. 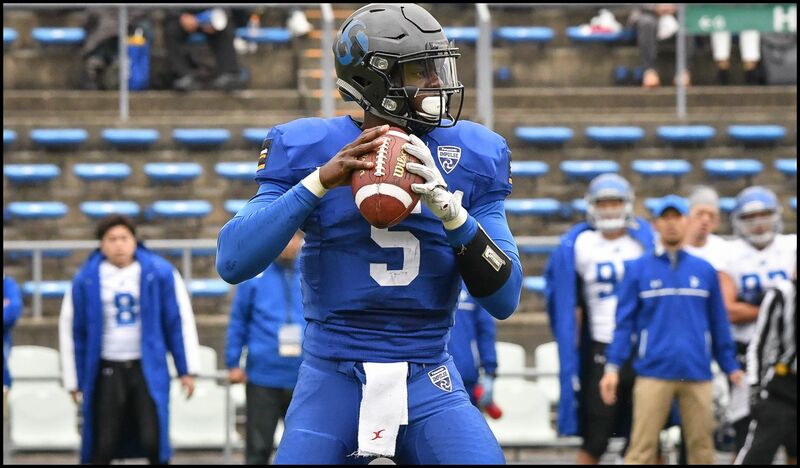 If Anderson returns, a second year in the system will mean that the offense will be even more fluid and they'll be one of the favorites again in 2018. 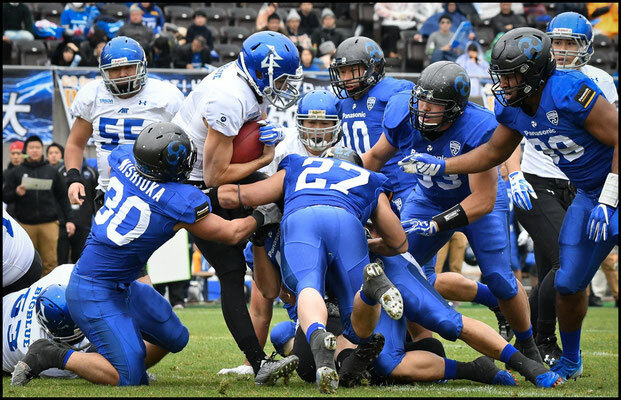 For this year though IBM and Fujitsu, teams that both had up and down seasons are showing that it doesn't matter how you start. If you can find your best form late in the year anything is possible.